Book Lots 201-250 - Mike Clum Auctions Inc.
201. [Mormon history] Times and Seasons, vols. 5 and 6, Nauvoo, IL, 1844-45. Nauvoo, IL: John Taylor, 1844-45. A single bound volume containing volumes 5 and 6 (whole numbers 85-131) of this bi-weekly Mormon magazine or paper; these volumes including the famous contemporary account of the mob-attack that resulted in the death of Joseph Smith in 1844. 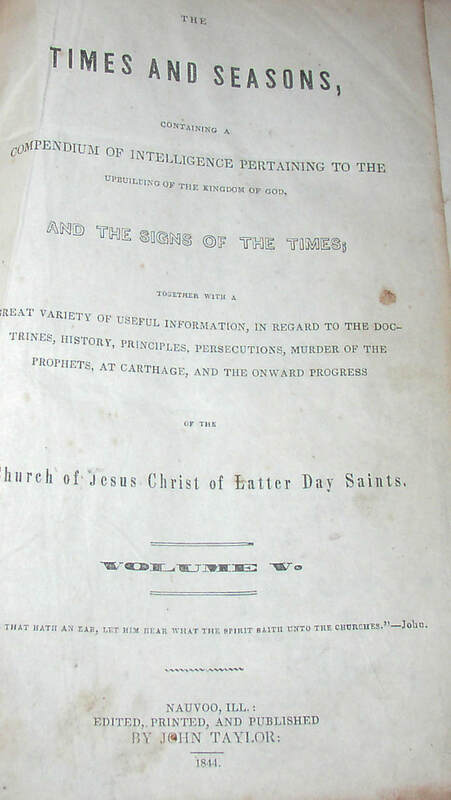 All Mormon publications from the Nauvoo period seem scarce on the market today: occasional scattered issues of Times and Seasons seem to show up now and again, but a bound volume like this is rarely encountered. A book with real historical importance. Condition: Binding only Good, but holding together, even while feeling shaky to some degree. 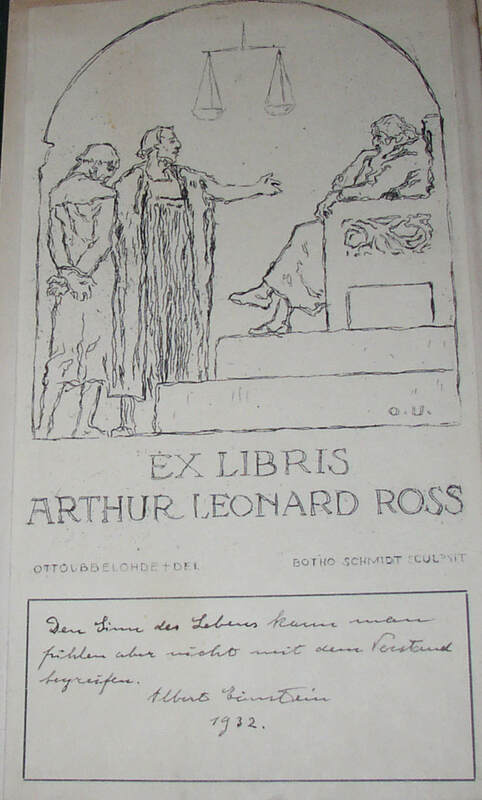 Bookplate on front free end-paper. Some loss to the leather spine. Occasional pencil comments in the margins, most on the History of Joseph Smith serialization. Expected foxing, small tears, etc. 202. 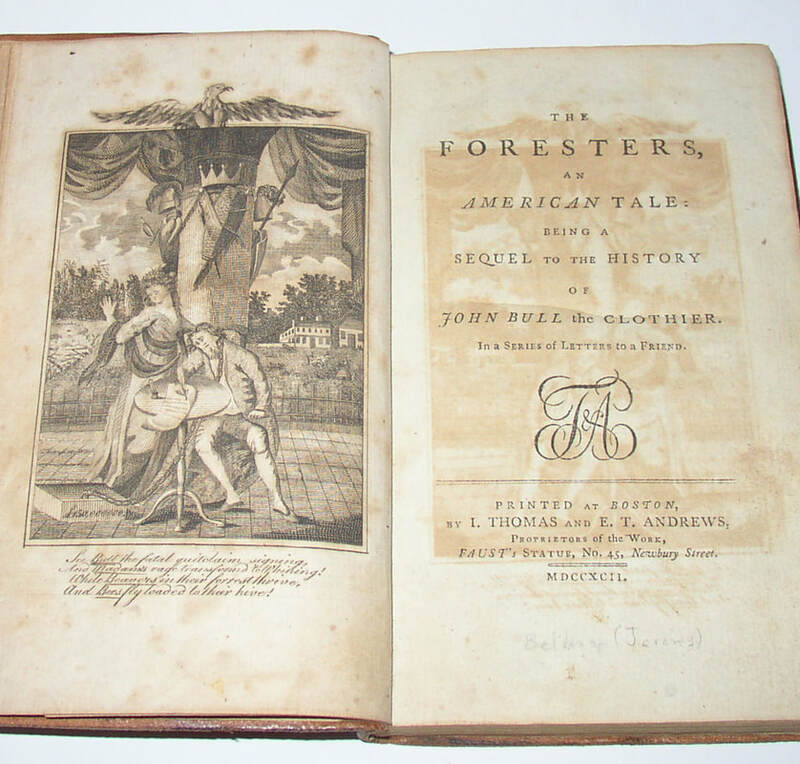 Jeremy Belknap, The Foresters, US 1st ed, 1792. Boston: I. Thomas and E. T. Andrews. 1792. First state of the frontispiece, with 150,000,000 pounds and no notice of engraver. Note on p. 77 has “Pennsylvania” without any spaces. Sometimes described as the third book of fiction written and published in the Americas. This copy in period sheep or calf, with some minor loss to the leather of the spine. A nice early example of American literature. Condition: Minor soiling or darkening to the paper here and there; some loss to the spine, as noted; minor loss to the front free end-paper and three ink initials on that page, and occasional other pages. Ink signature of Joseph Huntington and the date 1793 on the first text page (p. 3). 203. 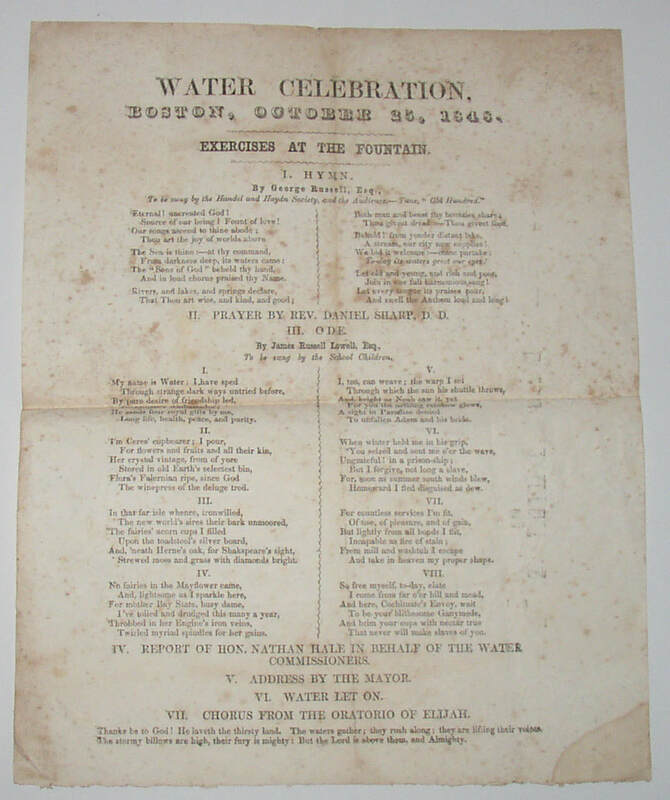 Rare James Russell Lowell broadside: Water Celebration, Boston, Oct. 25, 1848. [No city, printer or date given, but certainly Boston, 1848]. BAL 13067; “Water celebration, Boston.” According to the BAL, there are two states known, with no priority noted. A has a double rule below “Boston, October 25, 1848”; State B has a wavy rule below. The current example is B; BAL further notes of state B: “Two copies of this printing were received by Harvard on Oct. 25, 1848; one of these being inscribed in a contemporary hand: Printed in the Street & distributed while the Procession was passing.” A very ephemeral item, then, one would conclude. Condition: with foxing and staining and a fold, as well as minor wear and small tears at the edges. One hopes that the bit of water staining in the lower right corner is proof of the exuberance of the celebrations on the day. San Francisco, Colt Press, 1943. 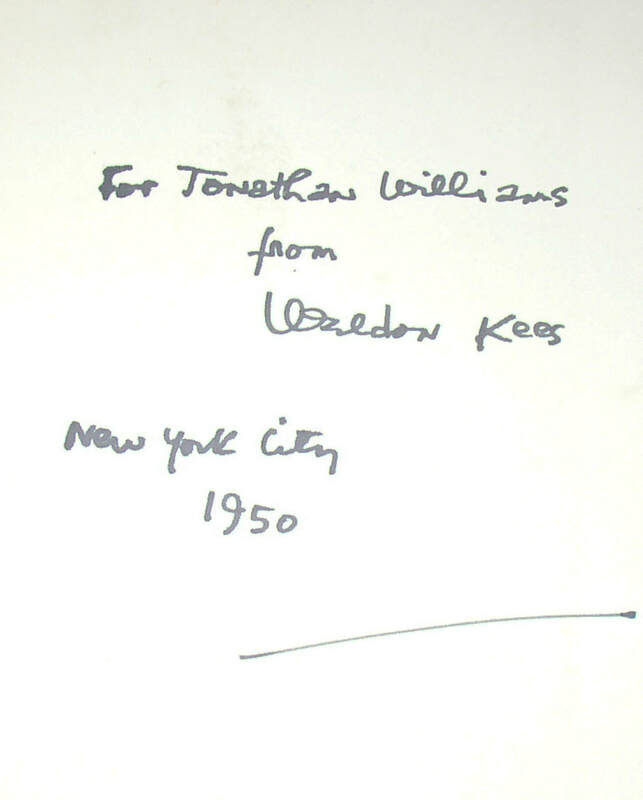 Kees’s scarce first book, this copy signed and inscribed “For Jonathan Williams from Weldon Kees, New York City 1950.” Presumably, this is the poet Jonathan Williams, one of the principals behind the Jargon Press. A great association between these two important figures. 205. 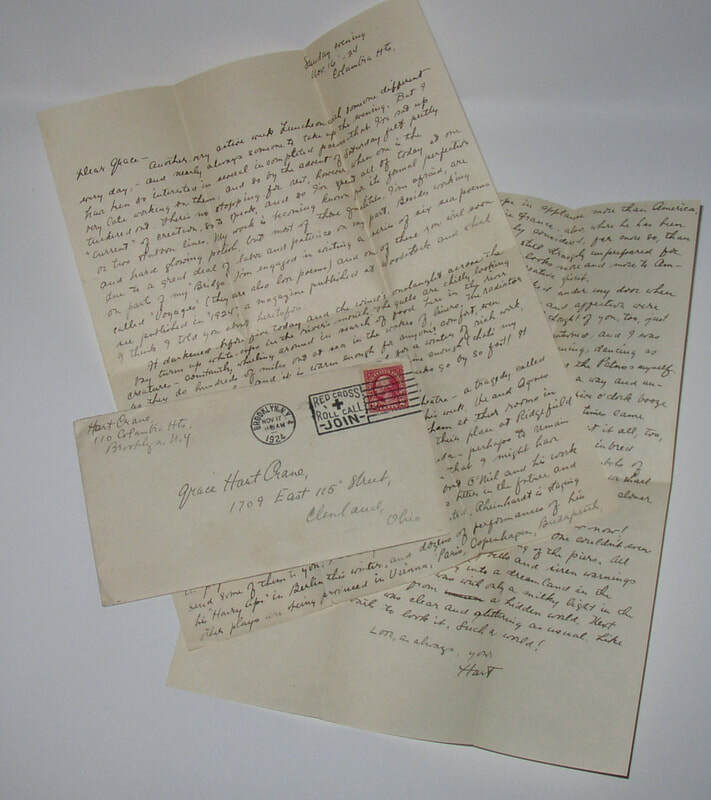 Manuscript/autographed letter from Hart Crane to his mother, dated Nov 16, 1924. 2 pages, plus original mailing envelope addressed in Crane’s hand. This letter is an especially significant bit of Crane’s extensive family correspondence. It has often been reprinted, appearing specifically in Thomas S. W. Lewis, ed., Letters of Hart Crane and his Family (NY: Columbia UP, 1974), on pp. 371-3. And while Lewis’s Calendar of Letters indicates that the original is owned by Columbia, recent correspondence with Columbia reveals that that published claim is incorrect: this letter somehow escaped Columbia’s acquisition of the Crane archive in the 1950s. This letter is accompanied by a 1964 invoice and an additional letter in which the dealer at that time provided a guarantee of the letter’s authenticity. In short, this is a key item of Crane’s that has been off the market for over fifty years. Condition: showing the usual wear for a letter now nearly a century old: about VG. 206. 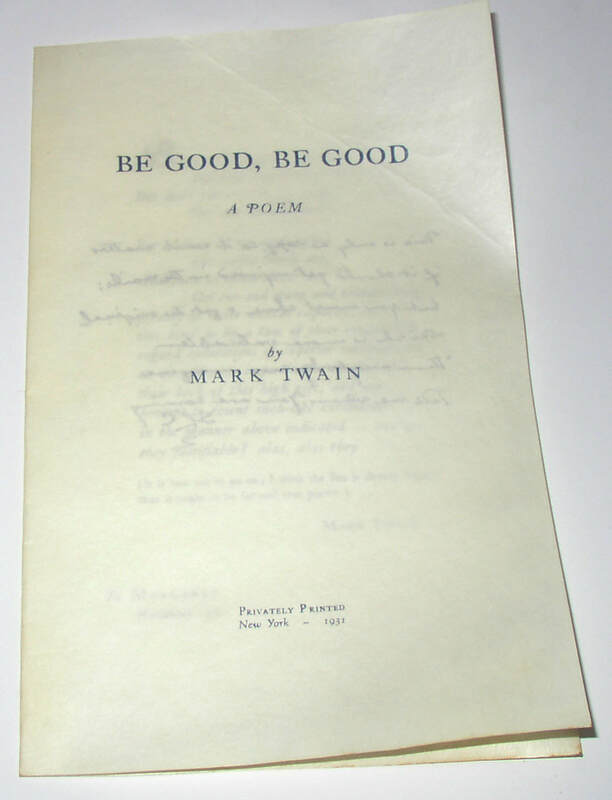 Rare Mark Twain, Be Good, Be Good, 1st ed, one of only 12 printed on vellum. New York: Privately Printed, 1931. BAL 3553. As noted in the BAL, “Ten or twelve copies were printed, in blue, on vellum, folded to make 4 pages”; this is one of those copies: printed in blue ink on vellum. As such, a very scarce bit of Twain ephemera. Condition: One fold to the front leaf; otherwise near Fine. 207. 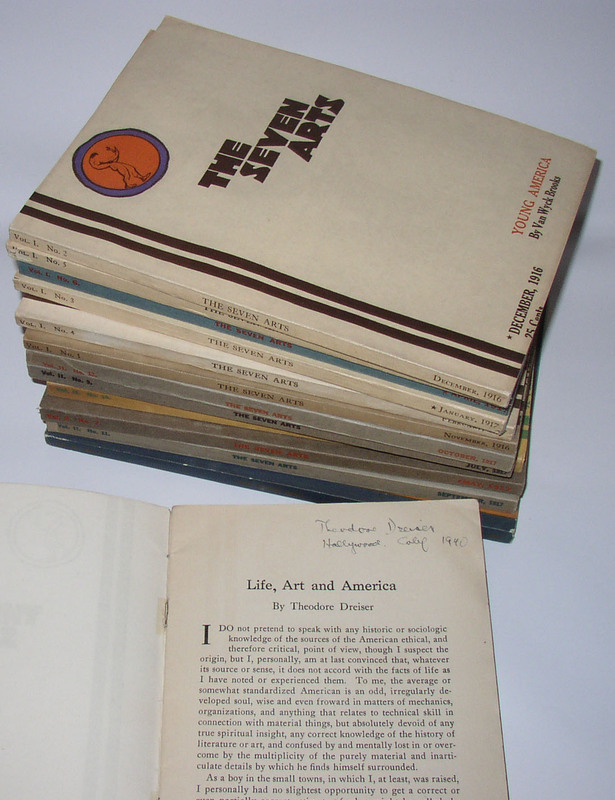 Rare Theodore Dreiser, Life, Art And America, signed 1st ed, 1917, with a full run of The Seven Arts. New York: Seven Arts, 1917. The Dreiser item states on the front wrap “Reprinted from the February, 1917, issue of The Seven Arts”. That this piece is properly understood as a separate book publication (or booklet, perhaps) is indicated by the pages having been renumbered, starting with 1: this is not a mere off-print, but a separate, stand-alone publication. 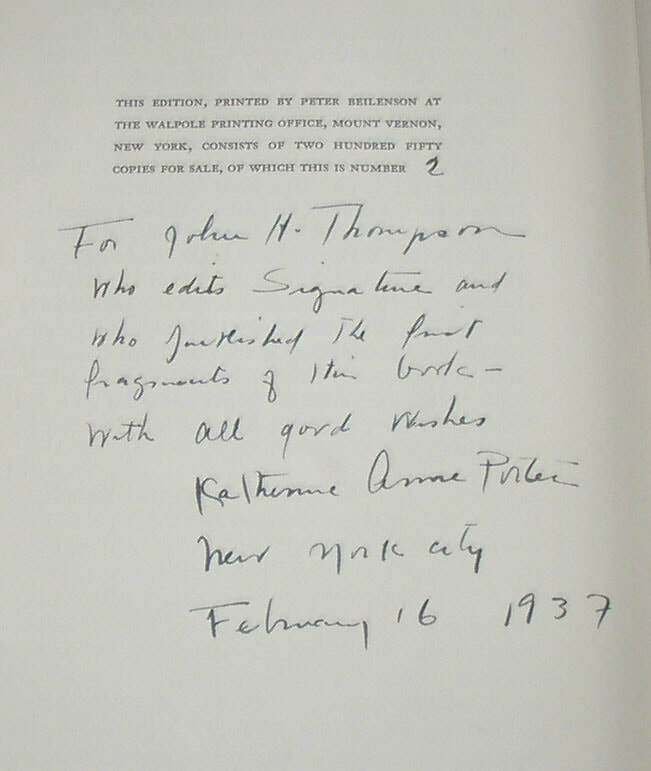 This copy signed on the title page “Theodore Dreiser Hollywood, Calif 1940.” A scarce Dreiser item, accompanied in this case by a complete run of all twelve issues of the “little magazine” The Seven Arts. A key literary and cultural periodical from during the years of WWI, and filled with contributions by many of the central figures of the time: Sherwood Anderson, Kahlil Gibran, D H Lawrence, Carl Sandburg, Amy Lowell, Robert Frost, Bertrand Russell, Eugene O’Neill, and others. The Dreiser item now held in a chemise and slipcase. 208. 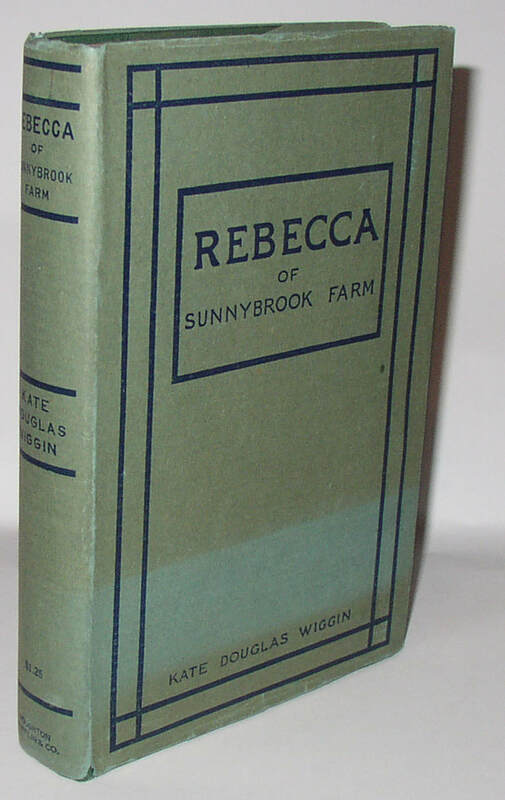 Kate Douglas Wiggin, Rebecca of Sunnybrook Farm, 1903 edition in scarce dust jacket. Boston: Houghton Mifflin, 1903. BAL identifies at least four printings through 1903, this is the one hypothesized as fourth, though their ordering is described as only tentative. Spine lettering seems to be 1/8” tall. 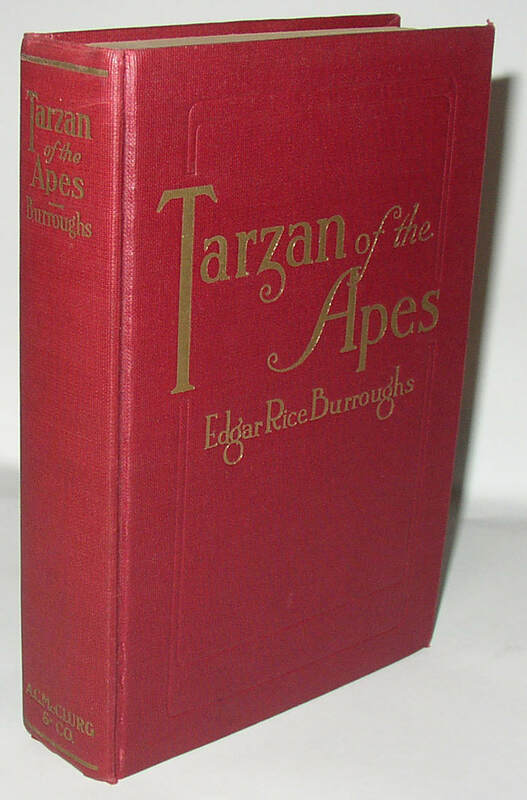 Nevertheless, a collectible copy of an early printing because it includes the original dust jacket, which has only some light fading on the front panel, a thin scratch on the rear, and some small edge tears. Condition: Book has a grey scuff on the fore-edge and some toning from the jacket; jacket as described. Overall VG/VG. 209. 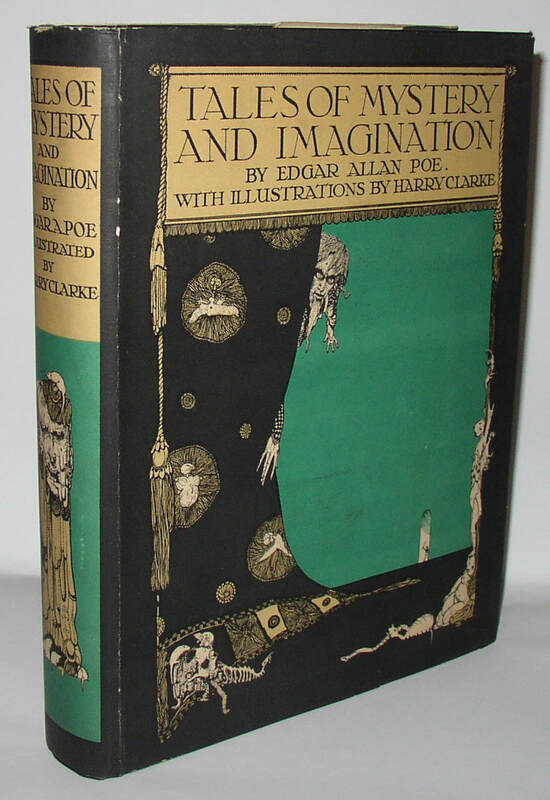 Harry Clarke illustrated Poe, Tales of Mystery and Imagination. London and New York: Harrap/Brentano’s [not dated, but 1928 or before]. Large-format gift book with stunning illustrations by Clarke; this copy in especially beautiful condition in an original dust jacket that is almost as perfect. Condition: book with owner’s inscription dated 1928 on the front paste-down; toning on endpapers. Jacket close to Near Fine, with a couple of short closed tears, the longest (at the joint between the spine and the rear panel) is about 5/8”. It is unusual, I think, to find this book in this condition. 210. 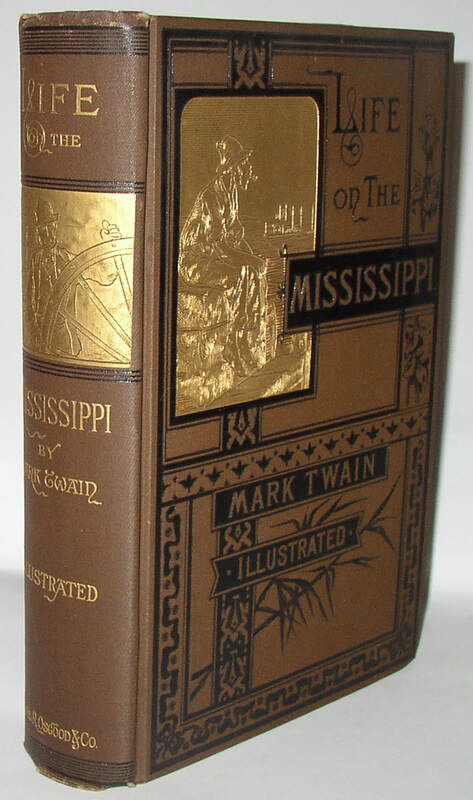 Mark Twain, Life on the Mississippi, a beautiful 1st ed. copy. Boston: James R. Osgood, 1883. Although there is some bumping to the cloth at the base of the spine, this copy of this book remains very beautiful: it has obviously been well-taken-care-of, for more than a century. 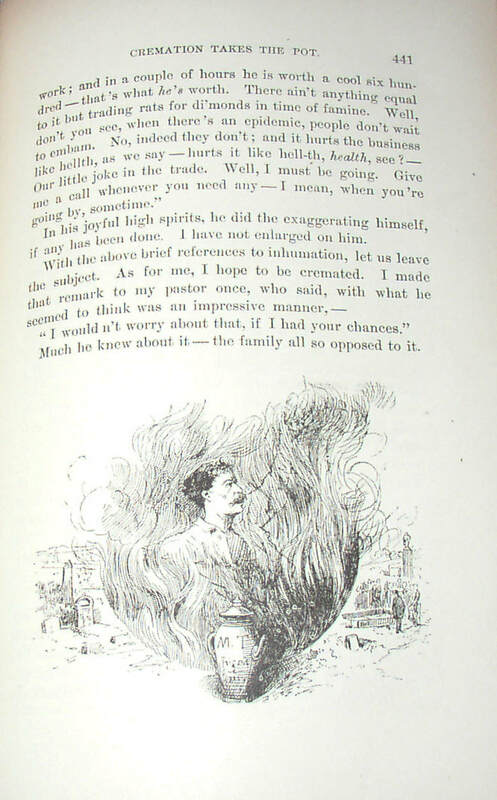 This copy is what the BAL describes as the “Intermediate A” state, in which the tail-piece on page 441 is present showing Twain’s funerary urn and the flames of cremation about Twain’s figure. The caption to the image on p. 443 has been corrected to “St Charles Hotel”. This state seems much scarcer than the Intermediate B state, in which the tailpiece on p. 441 has been removed. A collectible copy. Condition: Very close to Near Fine. New York: Rinehart, 1948. Both with the Rinehart loge/colophon symbol on the copyright page, as required, and both in first state dust jackets, with no reviews or blurbs on the flaps other than the long Stanley Rinehart statement. Along with a first edition copy of Barbary Shore (1951). 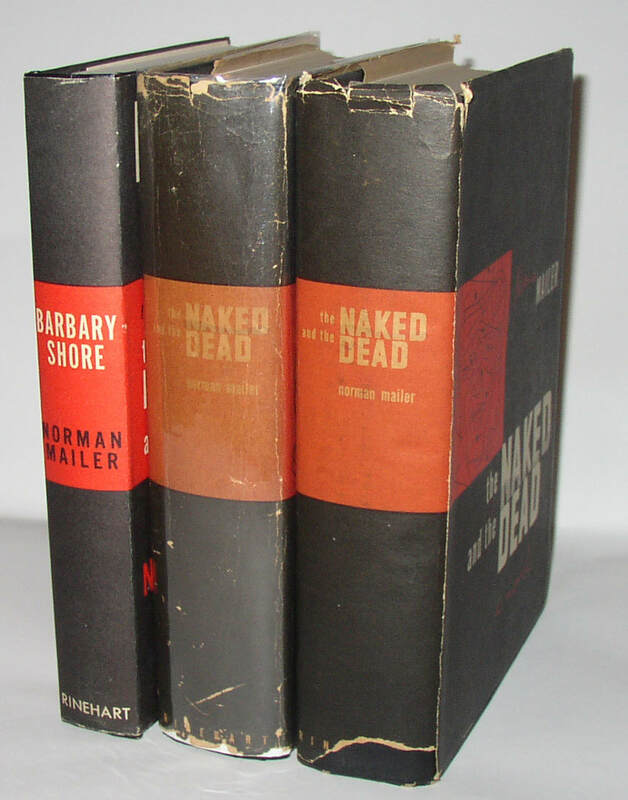 Mailer’s first book was produced from materials that haven’t always held up very well: these copies do exhibit some flaws, although Barbary Shore is in good shape. Condition: One copy of Naked is about NF, with a dj showing some chipping at the edges and corners and overall browning. Other copy of Naked is G+ to GV-; its dj is the same, but with a 2” by ¾” chip from the base of the spine. Barbary close to NF/NF. 212. Ashton Dore, ed. Poets and the Past, signed limited ed, signed by William Carlos Williams, et al. Andre Emmerich Gallery, 1959. An anthology of poems accompanied by photographs of pre-Columbian art, this copy one of only fifty copies featuring bound-in pages with all the poets’ signatures, including W S Merwin, William Carlos Williams, I A Richards, Octavio Paz, St-Jean Perse, Barabra Howes, Theodore Roethke, and others. This copy is number VI. 213. 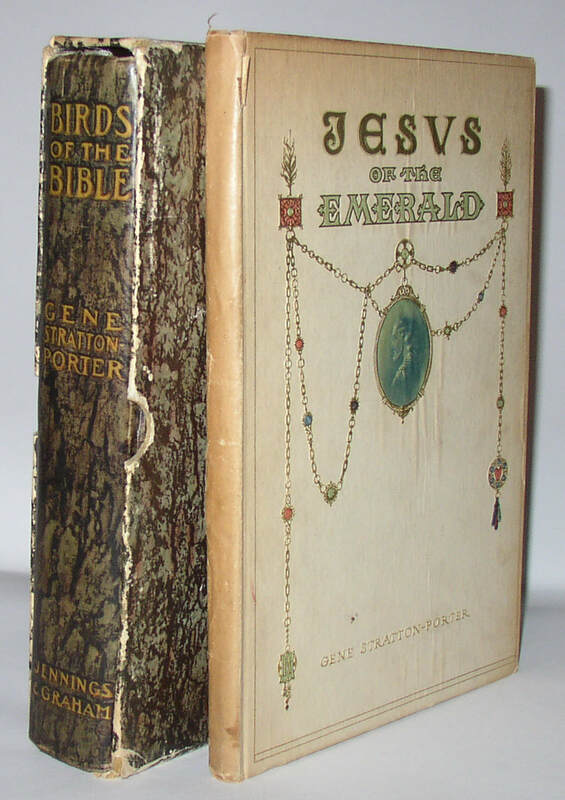 Gene Stratton-Porter, Birds of the Bible, 1st edition in slipcase. Cincinnati Jennings & Graham, 1909. Scarce early book from this collectible author; this copy is the very scarce original slipcase, which is showing some noticeable wear. With Stratton-Porter’s Jesus of the Emerald, 1st edition (1923). 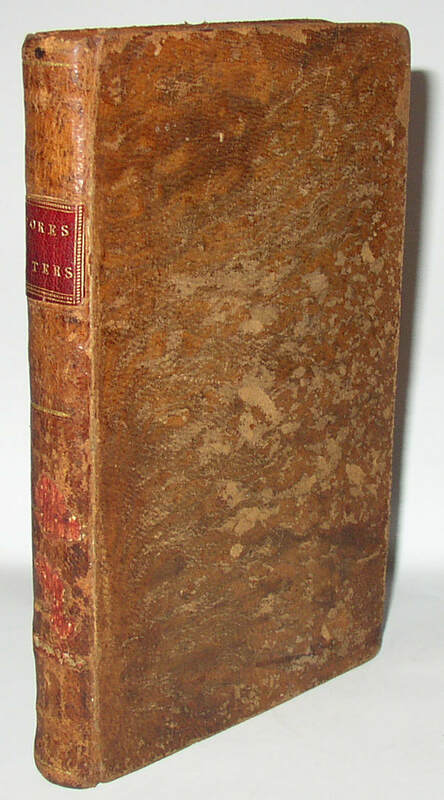 Condition: Birds is Near Fine, with slipcase showing wear to the edges and some splitting, but still holding firm. Jesus of the Emerald, with some wear and fading to the fragile paper covering the boards: split open at one corner and a 1” paper tear at the top of the joint between spine and front board. Sale Estimate: $150-250.00 for both books. 214. 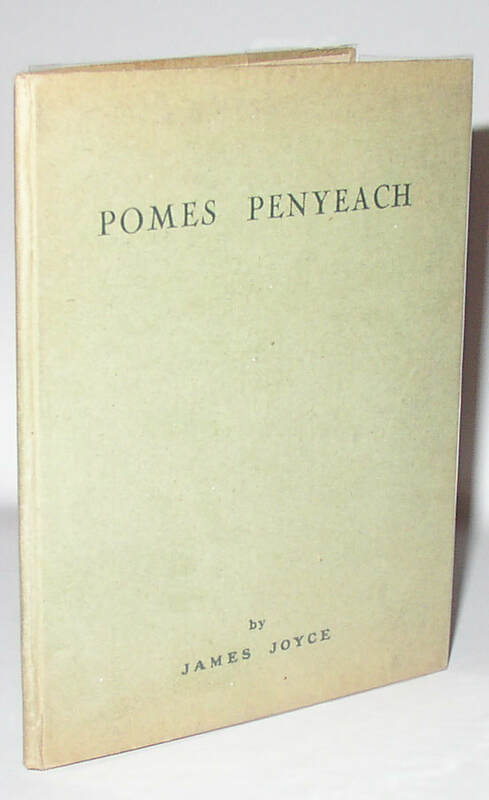 James Joyce, Pomes Penyeach, scarce 1st edition (1927). Paris: Shakespeare and Company, 1927. Errata sheet present, but no glassine jacket. Still: a very nice copy of this book that often seems to be worn in the spine area. Pale green paper-covered boards. Rear board reads “PRICE ONE SHILLING” and “Herbert Clarke, Paris.” In a bookseller’s envelope and with an accompanying letter dated 1963. Condition: binding thread has come loose from the lower sewing structure, but everything remains solid at the top. Mild fading at the top of the boards. A bit of surface bubbling or puckering to the paper on the back board, apparently from the moment of gluing up the paper to the boards. Still close to Fine, I think. 215. 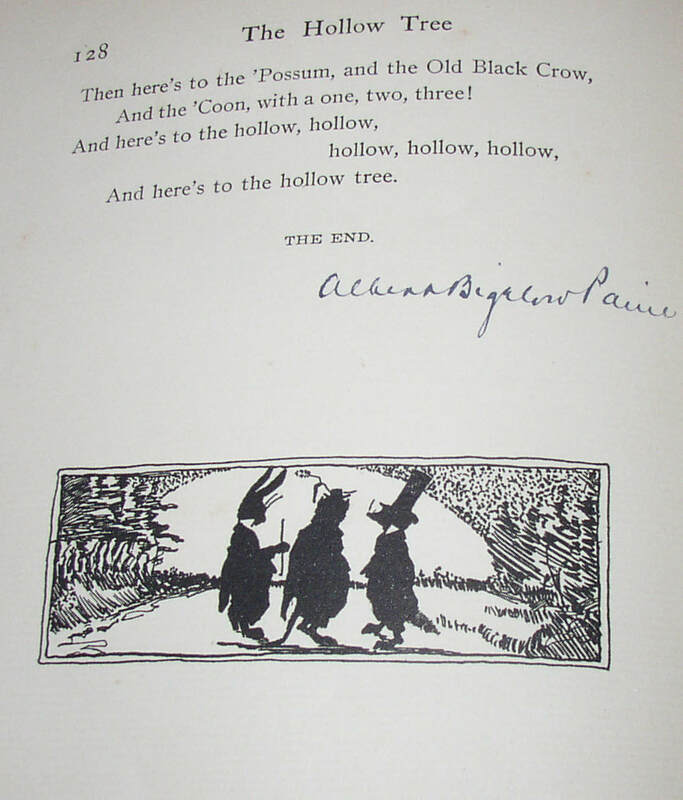 Albert Bigelow Paine, The Hollow Tree, 1st ed, signed and inscribed to his daughter. New York: R H Russell, 1898. A popular book that led to a series of other, related books, this copy is surely the most important copy that survives. 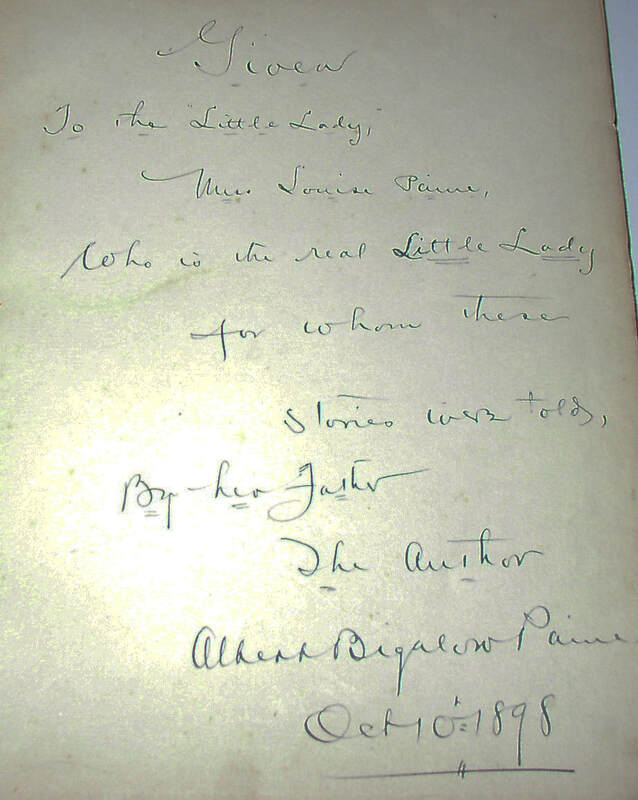 It is inscribed to the author’s daughter, who is described as “The real Little Lady for whom these stories were told,” and the figures of “the Little Lady” and “the Story Teller” appear within the book. Paine has also signed the book at the very end, and along the way he has made a couple of corrections by way of proofreading. A previous bookseller’s description, laid in, suggests that this is, for all practical purposes, the equivalent of a dedication copy, although no actual printed dedication to the author’s daughter is present; it is hard to disagree with the assessment, though. For a collector of Peter Parley to Penrod children’s books, this copy is as important a copy of this book as could be found, I think. Condition: With wear to cloth spine ends; chipping and some loss to paper-covered boards, especially at the tips. Occasional short closed tears on interior pages. Overall near VG. Now hosed in clamshell box made by (and signed by) the Chelsea Bindery. 216. 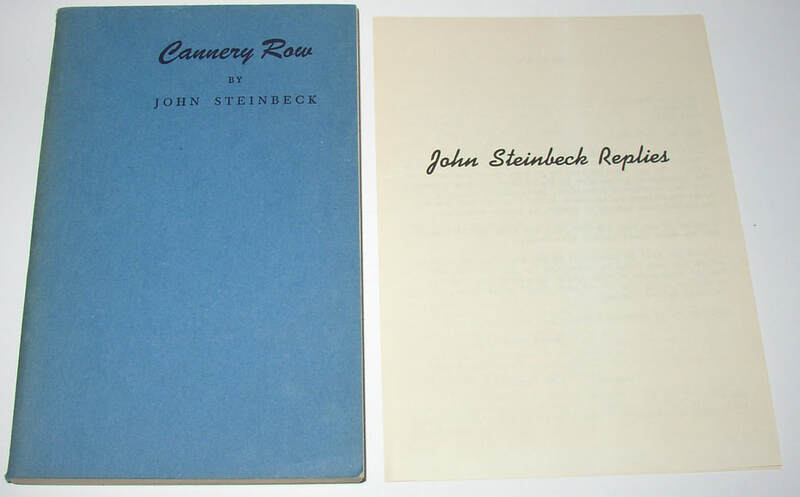 Two scarce John Steinbeck Items: J S Replies and Cannery Row advance copy in wrappers. Slightly the more common item of the two is an advance copy of Steinbeck’s Cannery Row in printed blue paper wrappers: an advance state of the first edition. The scarcer item is a single-fold four-page pamphlet titled “John Steinbeck Replies” in which he answers a letter inquiring about an allegation that The Grapes of Wrath was “Jewish propaganda.” A very scarce item, this copy having been protected in an envelope for the last 55 years. Condition: Cannery Row is VG+ to NF, with mild toning to the spine, and a mild bump to the bottom outer corner. John Steinbeck Replies is nearly Fine and scarce as such. 217. 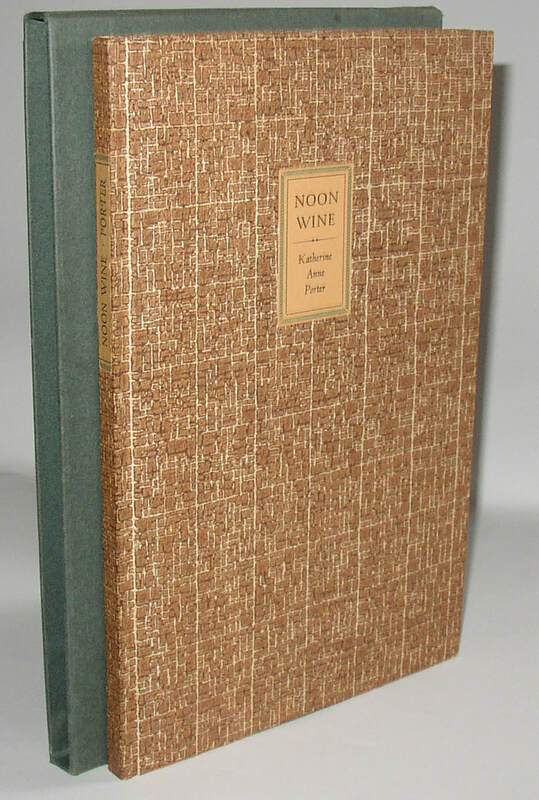 Katherine Anne Porter, Noon Wine, signed 1st limited ed, Presentation copy. Detroit: Schuman’s, 1937. Copy number 2 of a limited edition of only 250 total copies, this copy signed and inscribed on the limitation page to John H Thompson, editor of Signature, where the portions of Noon Wine were first published. An especially wonderful inscription and association for this copy. In the original slipcase, and with a prospectus for the edition laid in. Condition: NF book; slipcase with a bit of wear-through to the paper covering at one short joint. Prospectus with some finger marks. 218. 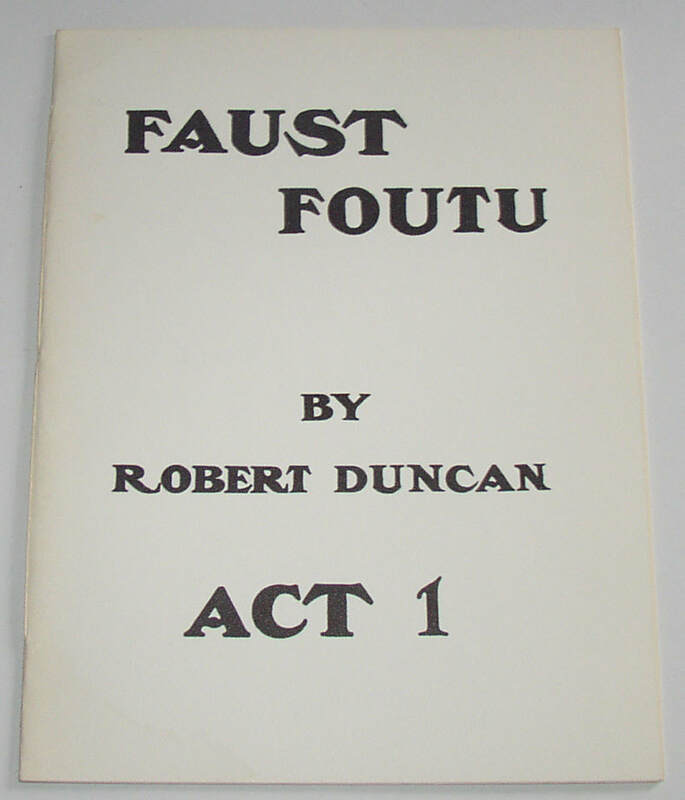 Robert Duncan, Faust Foutu, Act 1 (1958) one of 10 signed copies distributed in 1962. White Rabbit Press,1958. 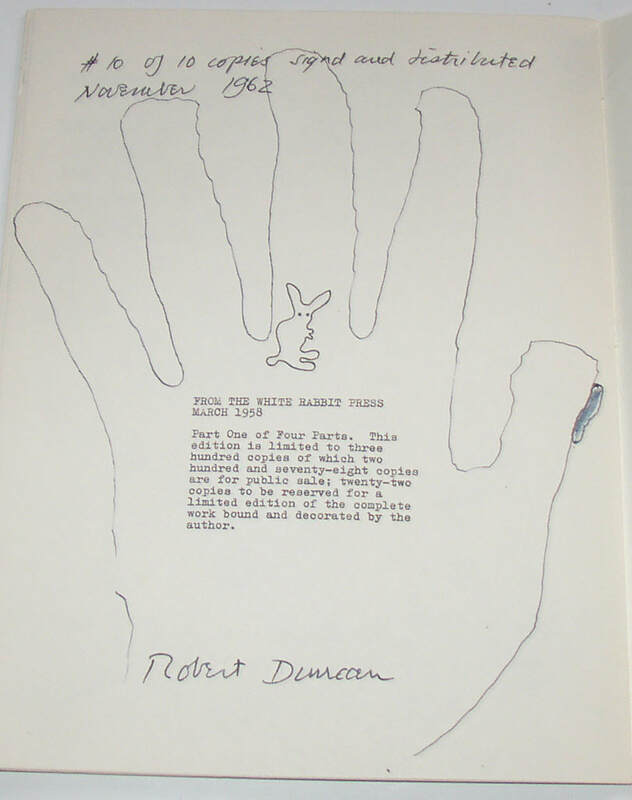 A nearly fine copy of the 1958 edition (limited to 300 copies), this one being number 10 of 10 copies of that edition with an additional handwritten limitation statement and signature by Duncan, with a drawing of a hand on the limitation page. Very scarce, of course. Condition: Fine, with some minor darkening at spine. 219. 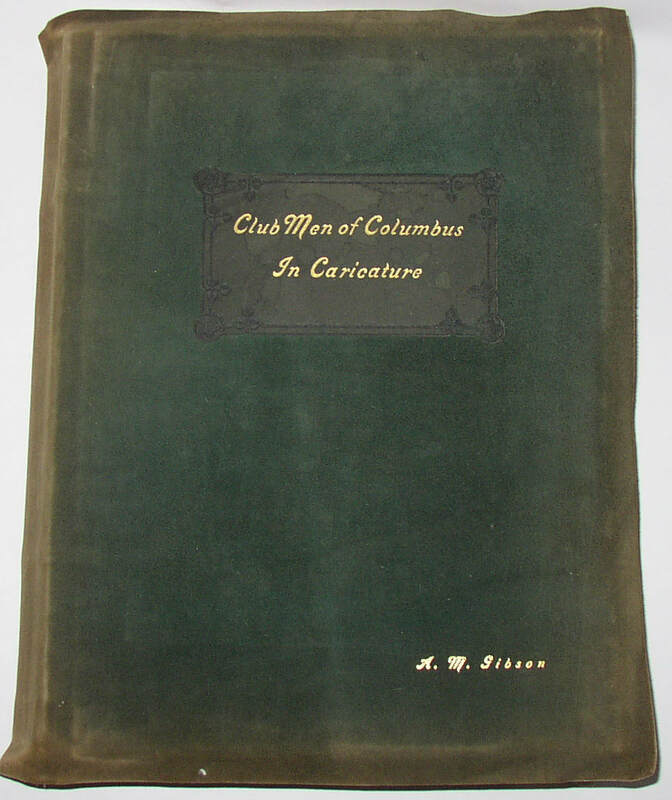 Billy Ireland, et al, Club Men of Columbus [Ohio]; Caricatures of Ohio Notables, 1911. 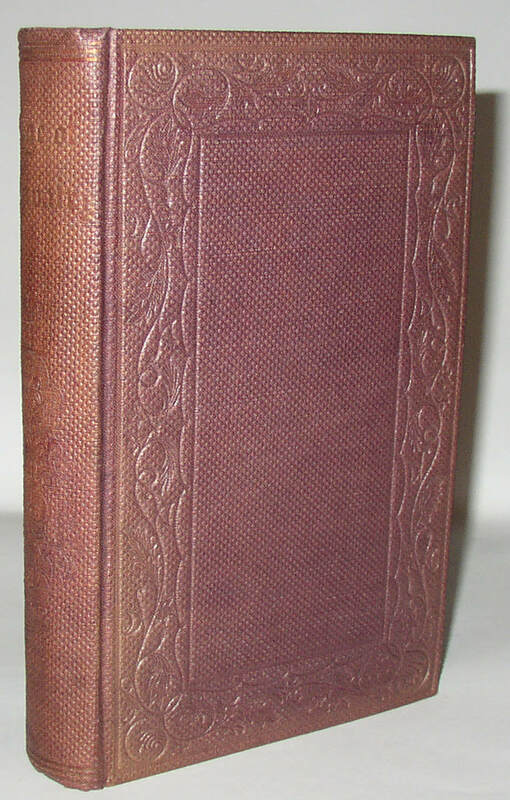 Columbus: W A Ireland, 1911; printed and bound by the Roycrofters. One of a series of similar books printed by the Roycrofters for notables in various cities; Cleveland, in 1910, may have been the first of the series, which eventually ranged at least as far as Louisville and Atlanta. All of these are somewhat scarce now. This copy with A. M. Gibson’s name in gilt on the front cover. Billy Ireland was a notable cartoonist in Columbus at the turn of the last century, and he contributed a number of the portraits here; Ohio State University has named its cartoon library in his honor. Condition: some spine roll; fading to green suede leather. Still near VG. 220. 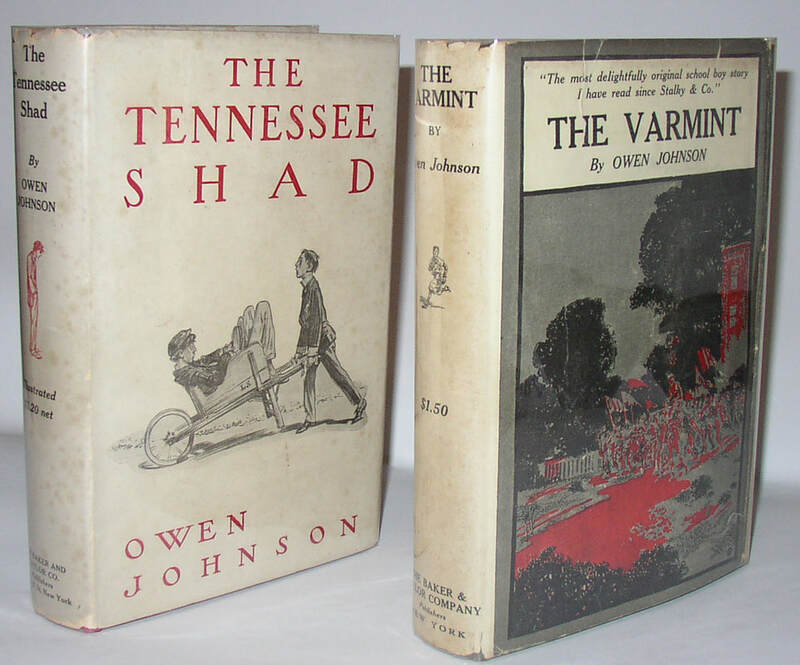 Owen Johnson: The Varmint & The Tennessee Shad, rare 1st eds in dj. Baker & Taylor, 1910 and 1911. From Johnson’s popular Lawrenceville books, which recount the adventures of Lawrenceville boys at the turn of the last century. Classic boy literature, and incredibly difficult to find in original dust jackets—as is especially often the case for books aimed at children. Condition: Both books VG or better; dust jackets in similar condition, with some grubbiness, minor chipping, and an occasional closed tear. But very scarce indeed in any original jacket. All in all, these are very appealing copies. 221. Ronald Firbank, Far Away . 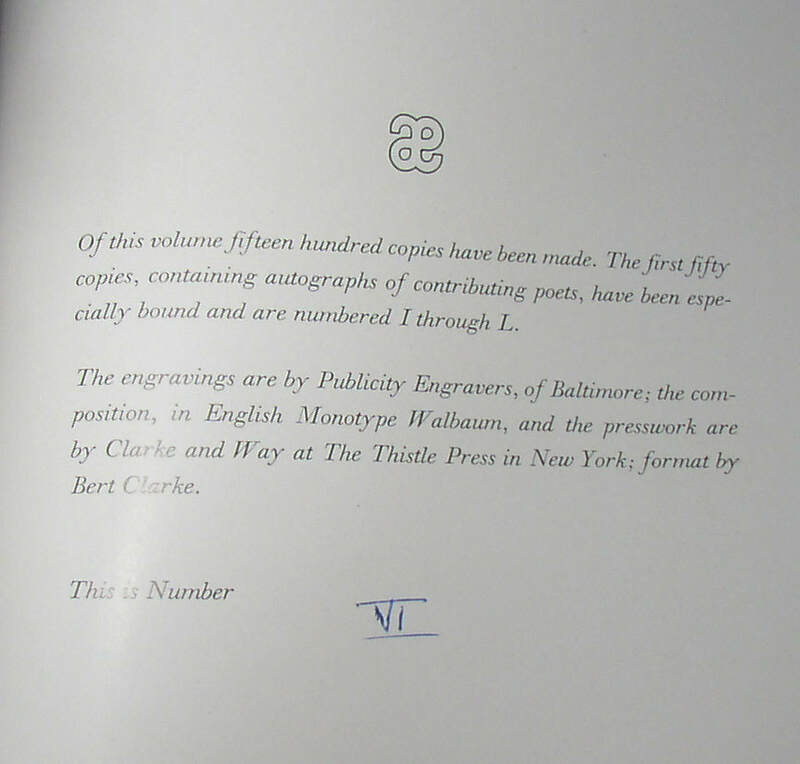 1st printed edition: 8 copies of a total press run of 100. Iowa City: Typographical Laboratory, 1966. Written in 1904, but not printed until this edition of 1966, which was limited to only 100 copies. This lot includes an incredible 8 of those 100 copies, three with blue wraps, five with cream wraps. Probably purchased new and never read. Condition: two copies with mild soiling or marking on the front wrappers; else Fine and As New. 222. 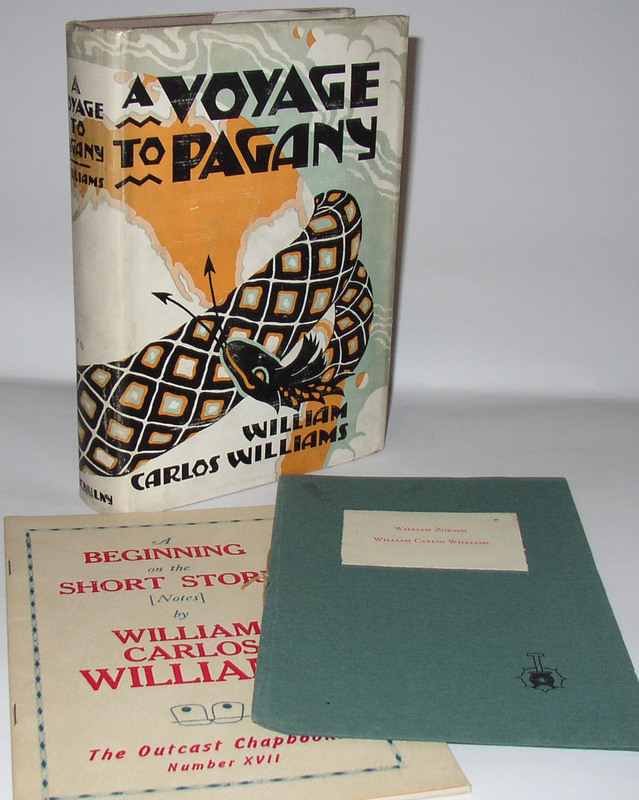 William Carlos Williams, A Voyage to Pagany, 1st ed in dj, plus 2 chapbooks. New York: Macaulay, 1928. An attractive copy in a jacket with some edge-wear, but virtually no chips or tears. With 2 additional William Carlos Williams items: Two Poems (Stovepipe Press, 1937) and A Beginning on the Short Story (Alicat Bookshop Press, 1950). Conditon: VG/VG or better on all three items. 223. 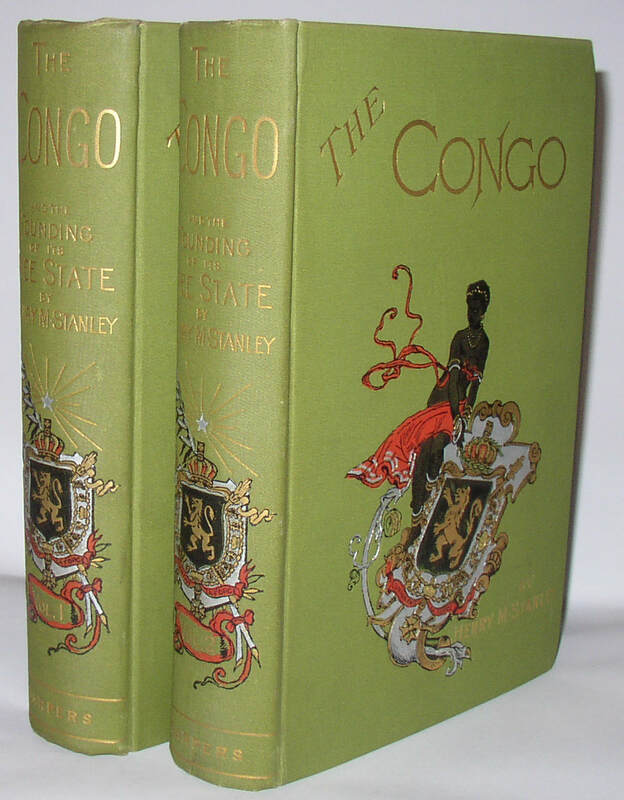 Henry M Stanley, The Congo and the Founding of its Free State, US 1st ed, 2 vols. New York: Harper & Brothers, 1885. 1st American edition of this classic of African exploration. Beautiful copies, with virtually no wear. Folding maps present’ also maps inserted into pockets at rear of both volumes. Stanley recounts, among other things, his famous encounter with Dr Livingstone. 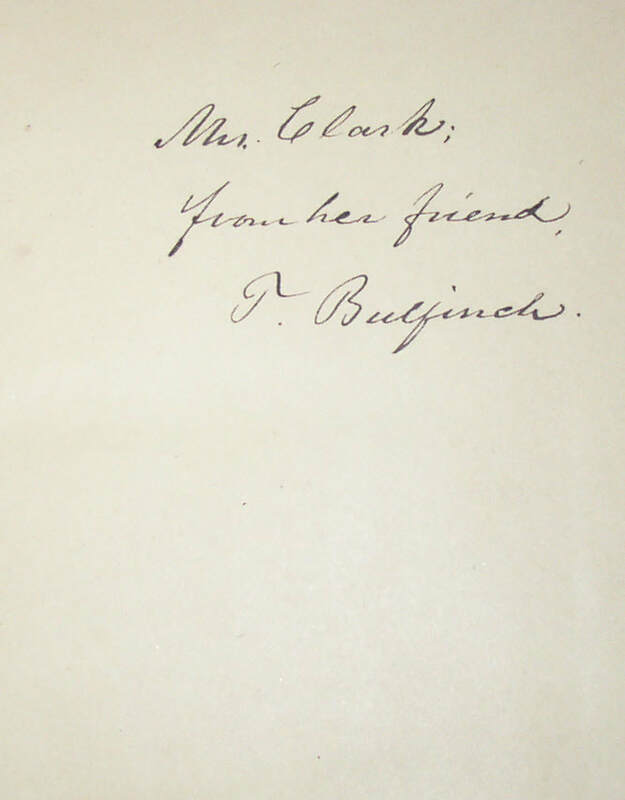 Condition: Near Fine; bookplates inside, and one droplet stain on the bottom page edges at the rear of vol. 1. Front hinge of volume 1 weakening and beginning to show splitting, but still firm. 224. 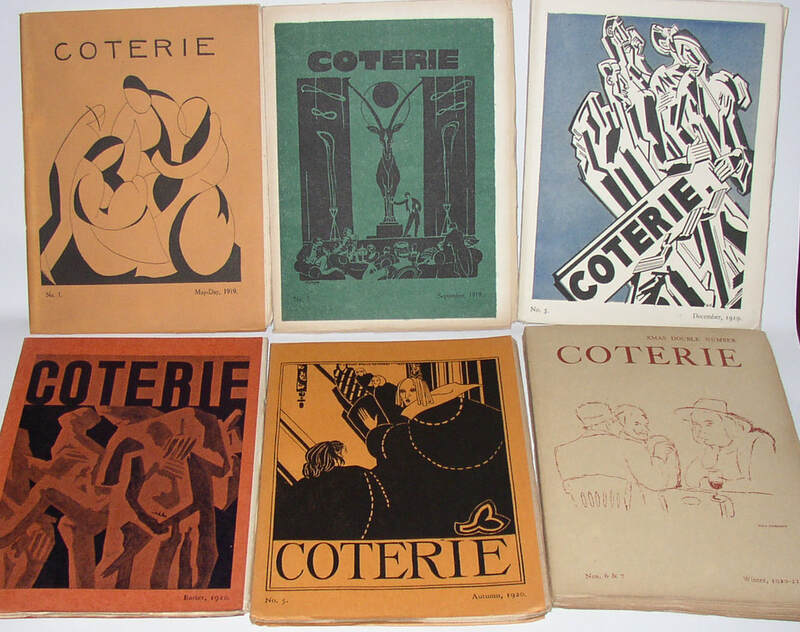 Aldous Huxley, T S Eliot, et al; full run of the literary journal Coterie (1919-21). London: 1919-21. Seven issues in six volumes. Important post-WWI literary journal from London, publishing just about everyone of note during the time: nevertheless, only a short run of 7 numbers in six volumes. These copies unopened. Condition: VG or better; unopened copies in very appealing condition. 225. 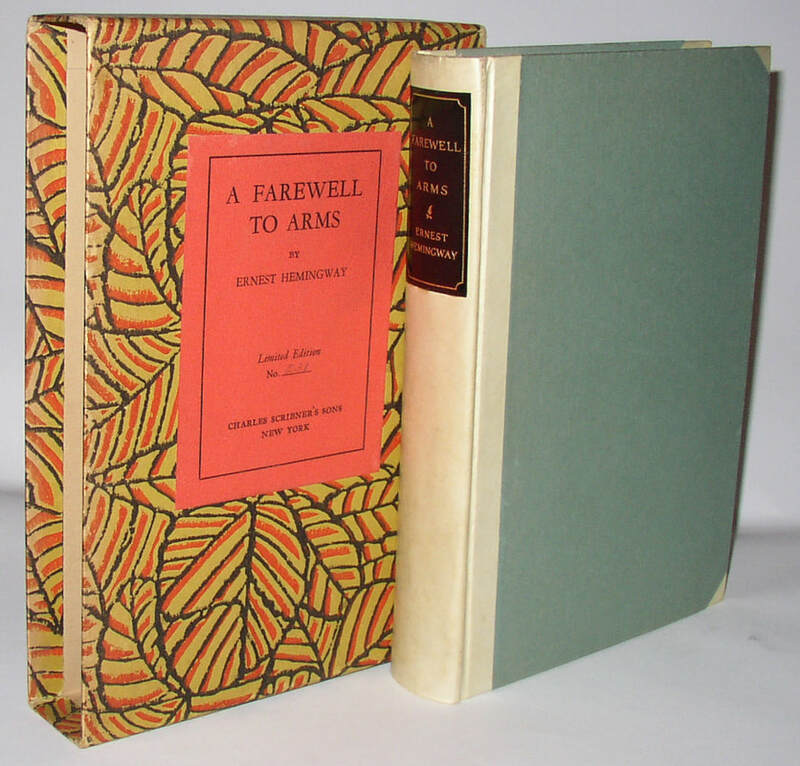 Ernest Hemingway, A Farewell to Arms, signed limited 1st edition in orig. slipcase. New York: Scribner’s 1929. 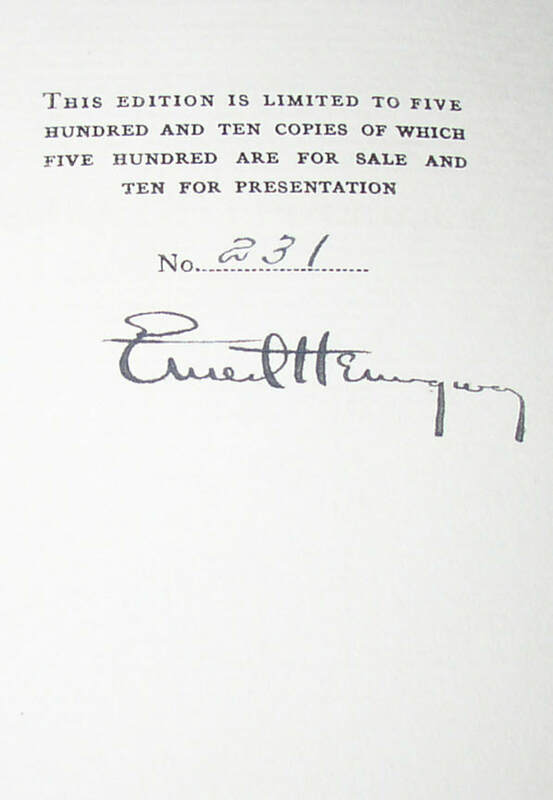 One of 510 copies; Hemingway’s only signed limited edition. Book and slipcase with matching numbers (no. 231), and the book is virtually as new, and well protected by the slipcase. The slipcase shows some minor surface wear, and the closed end of the base shows wear and a small visible gap. 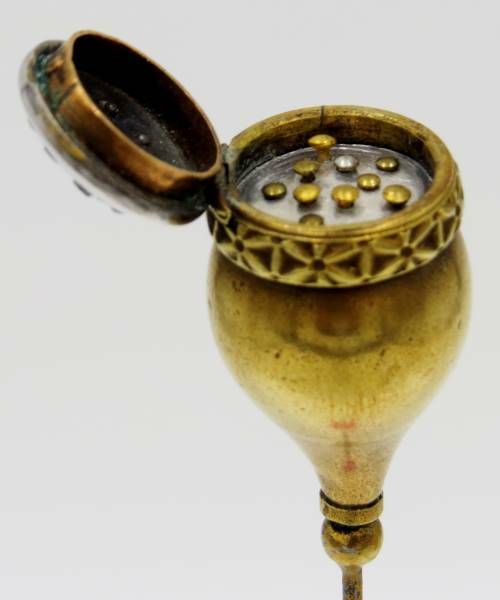 But the case still feels solid, and it has had no restoration or consolidation. A better-than-usual copy. A wonderful book. 226. 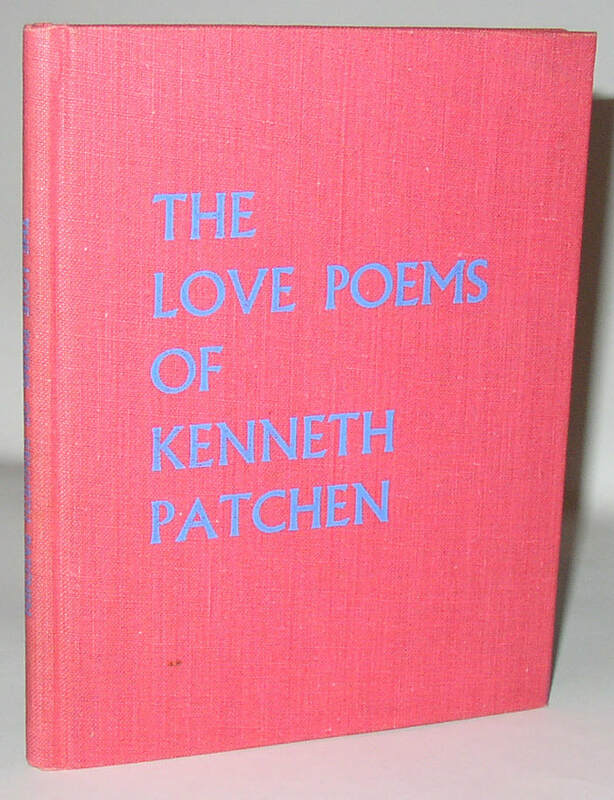 Kenneth Patchen, The Love Poems of Kenneth Patchen, hardcover 1st edition. San Francisco, City Lights, 1960. Not a rare book in softcover, but surprisingly hard to find in the hardcover issue. Condition: Externally NF, but with significant internal foxing spots. 227. 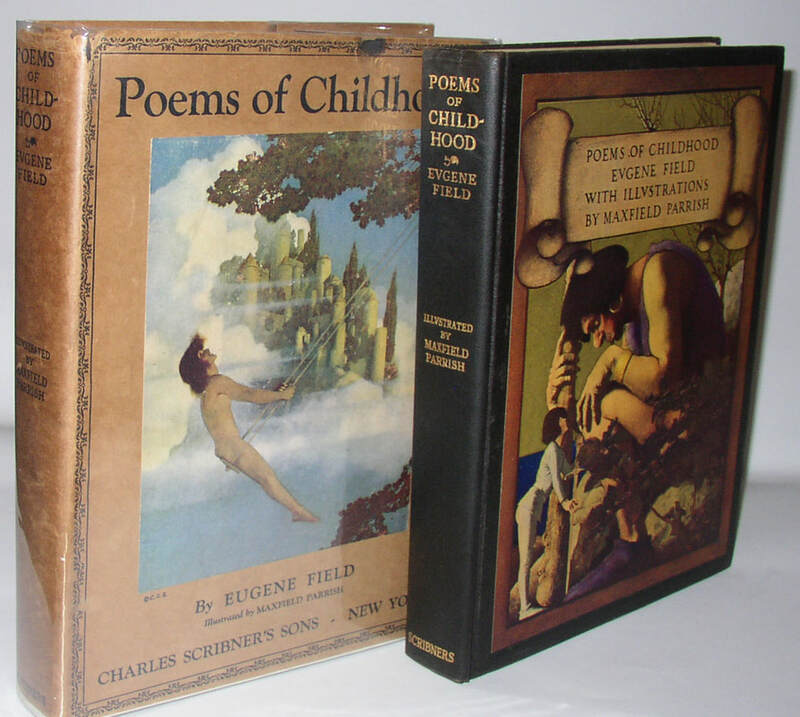 Eugene Field, Poems of Childhood, Illustrated by Maxfield Parrish, scarce in dj. New York: Charles Scribner’s Sons, 1904. 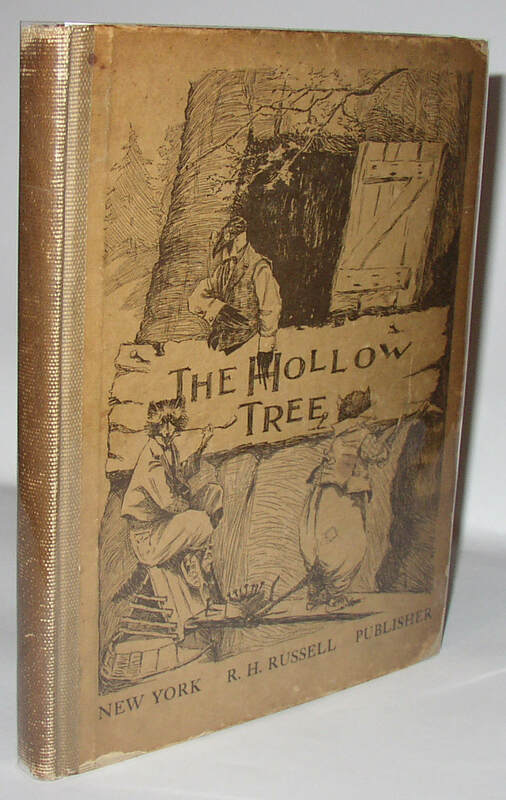 1904 appears on the title page; the copyright page shows the Scribner’s seal and no notice of a later printing, but the jacket suggests this is a later copy, since it advertises Kenneth Grahame’s Wind in the Willows . Jacket has a color Parrish image affixed to the front panel. A collectible book, scarce in the jacket, even if this may not be the very earliest jacket. Condition: Book is NF, with very little wear and no internal markings, except for a light bookseller’s note and price. Jacket with a dark spot on front panel (above “ild” of Childhood), and minor chipping at spine ends and tips; looks like there’s some splitting starting at the corners of the jacket as well. Near VG or better, I think. 228. 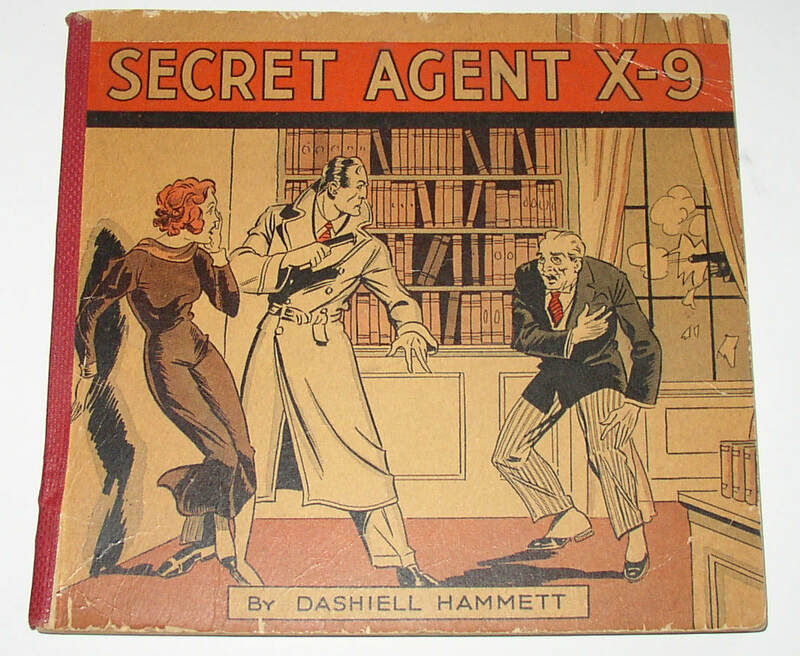 Dashiell Hammett/Alex Raymond, Secret Agent X-9, 1st edition. Philadelphia: David McKay, 1934. Reprints of newspaper strips. No indication of later printing. There is a persistent suggestion that Hammett’s contribution was all or partly ghostwritten, but it’s a scarce and collectible item, regardless. Alex Raymond was probably best known for his work on Flash Gordon. Condition: Near VG: wear to edges of boards and some corner bending (not too bad, really) at the lower outer corners of the boards. Three pages with corner bends. 229. 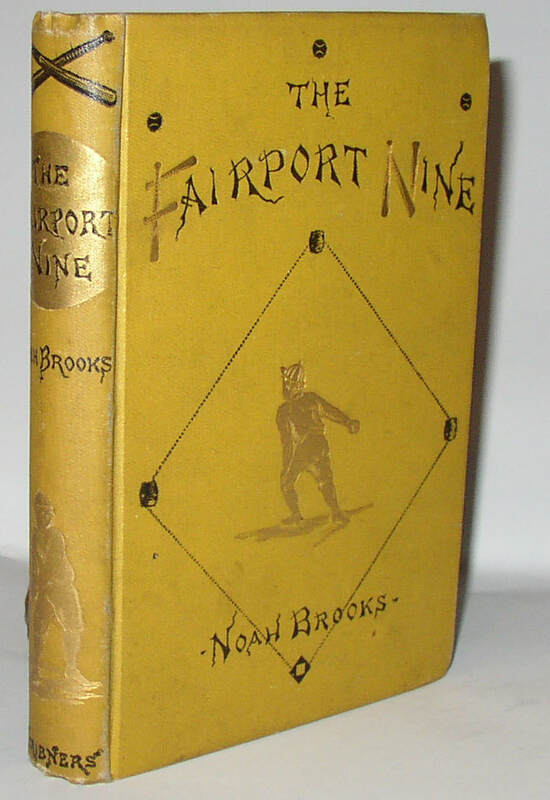 Noah Brooks, The Fairport Nine, 1880; the first baseball novel. New York: Charles Scribner’s Sons, 1880. First edition of this book which is often claimed as the first baseball novel. A boy’s book, and thus difficult to find in reasonable condition: this copy with some external grubbiness, but very clean and handsome. Collectible. Condition: Very mild spine roll, bumping to cloth of spine ends, but no loss. Tips of boards turning in a bit and with tiny 1/8” points of wear-through to the cloth on the lower tips. Yellow cloth cover shows grubbiness to the exterior. No ink writing inside: very clean. VG overall, I think. 230. 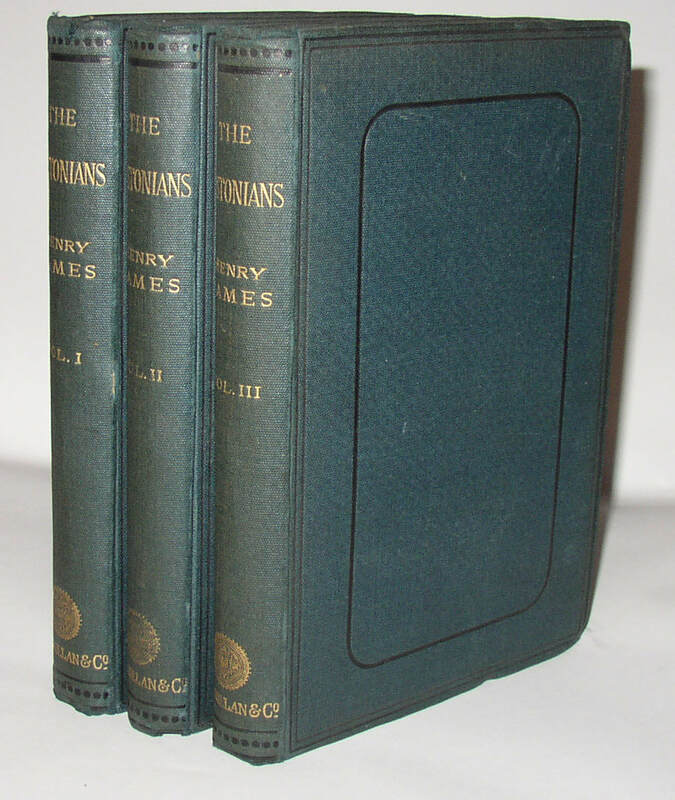 Henry James, The Bostonians, UK 1st edition in 3 volumes; original cloth bindings. London: Macmillan, 1886. A very nice copy indeed of a book that was apparently published only in an edition of 500 copies; these copies each stamped “With the Publisher’s Compliments” on the title pages. Scarce in the original cloth bindings, these copies are every attractive and very solid. Unusual as such, I think. 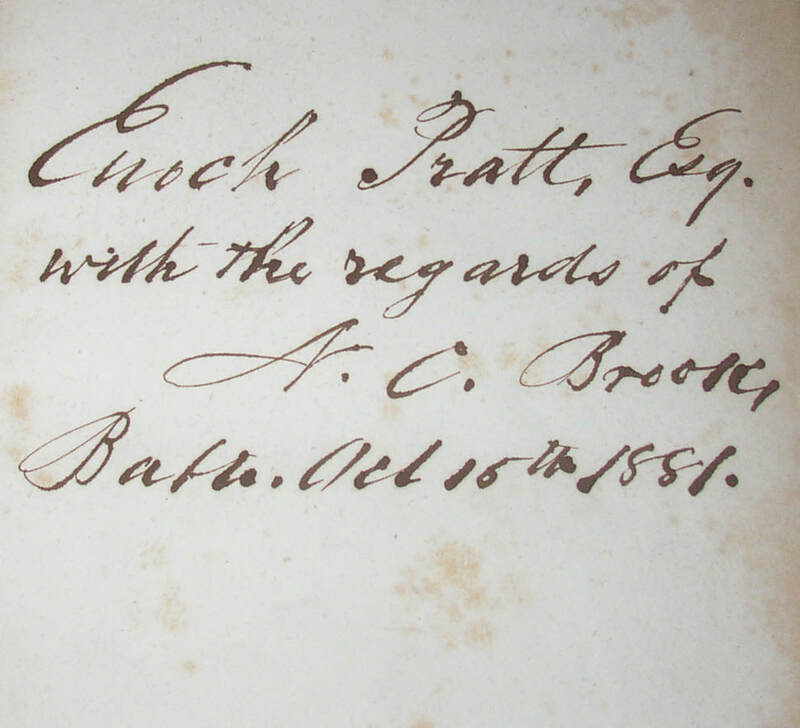 Condition: Bookplate of Oliver Brett in each volume; bumping to the cloth at the base of the spine on each, as well as a small number labels on the free end-pages. Occasional other small bumps. All of the hinges seem firm. A great set. 231. 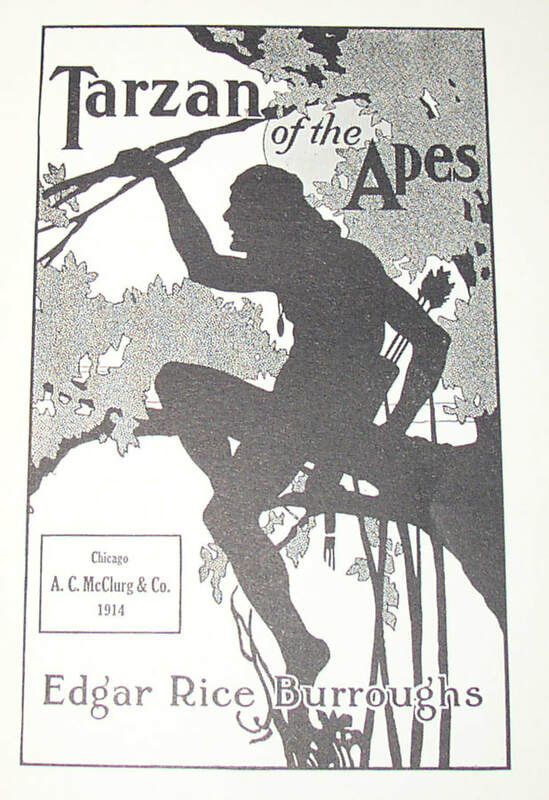 Edgar Rice Burroughs, Tarzan of the Apes, 1st edition, 1914. Chicago: A C McClurg, 1914. Burroughs’s breakthrough book, one that (obviously) set off a very long series of books, not to mention comics, movies, and all sorts of popular culture productions: in that sense, one of the twentieth century’s most influential books. First edition, in the first state binding. No acorn symbol on spine; printer’s info in two lines in Gothic/Old English type on copyright page. Small label of rare book dealer Philip C Duschnes on the rear board. No dust jacket present. Condition: One droplet spot on the bottom page edges, otherwise very nearly Fine. A very nice copy. 232. 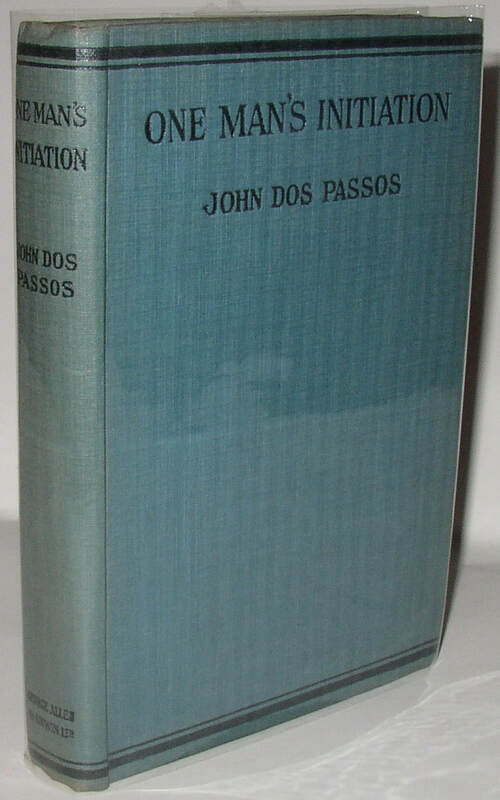 John Dos Passos. 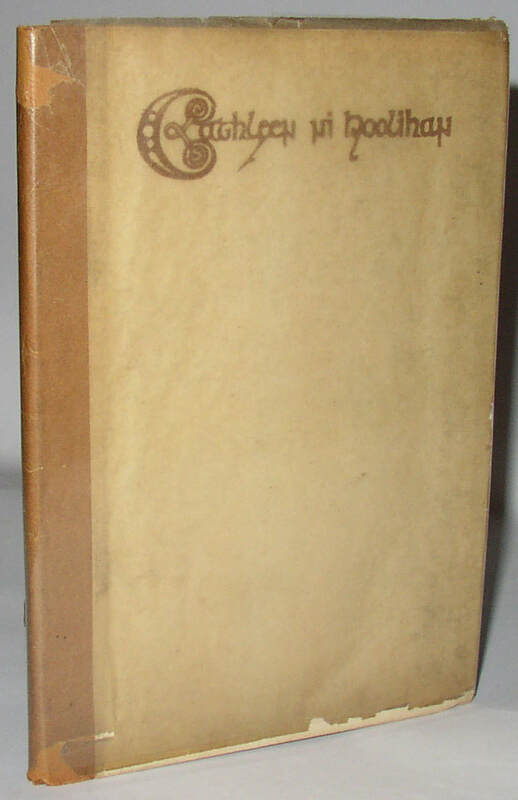 One Man’s Initiation—1917, signed and inscribed 1st edition. London: George Allen & Unwin, 1920. First edition, first state, with the word “flat” largely unprinted due (apparently) to type-batter on p. 35. 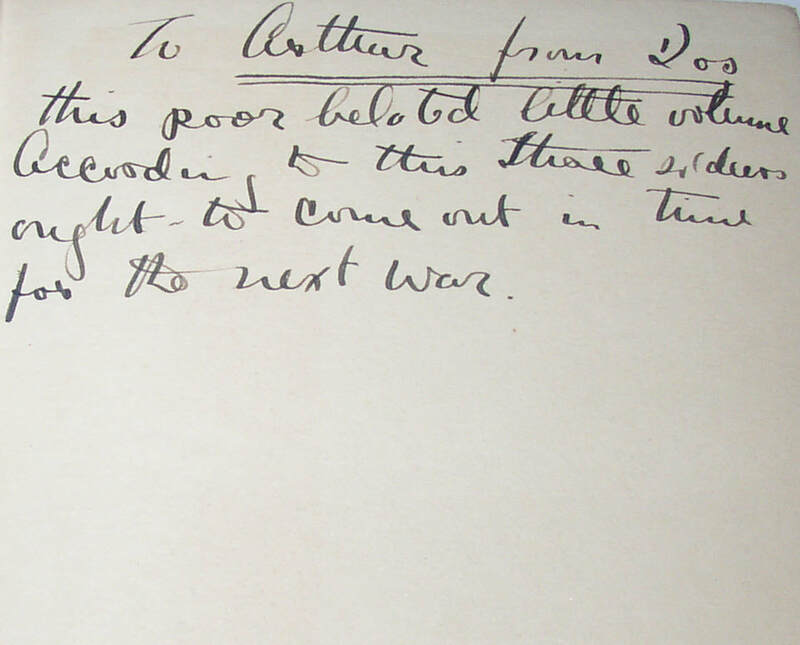 With a super contemporary inscription in the front free end-paper: “To Arthur from Dos/ this poor belated little volume./ According to this three soldiers/ ought to come out in time/ for the next war.” Three Soldiers would be published in 1921. Dos Passos’s first novel, with a contemporary inscription both preceding and referencing his break-out book. A very collectible example of this scarce book. Condition: Some spine roll and edge-wear: about VG. No dust jacket present. 233. 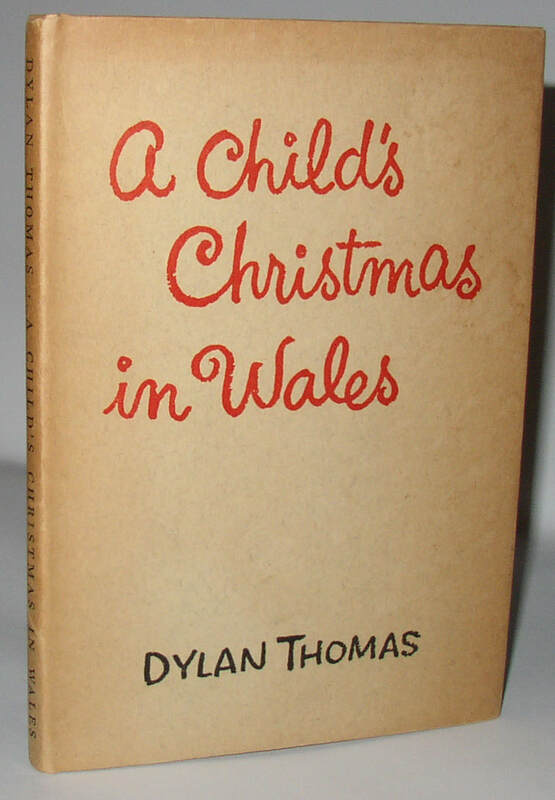 Dylan Thomas, A Child’s Christmas in Wales. US 1st ed, in dust jacket. Norfolk: New Directions, 1954. US 1st edition in dust jacket of this Christmas classic. A very attractive copy. Condition: Jacket with browning at the edges, and a couple of closed tears with creases on the rear panel (affecting an area about 3” by ½” only). VG/VG or better. 234. 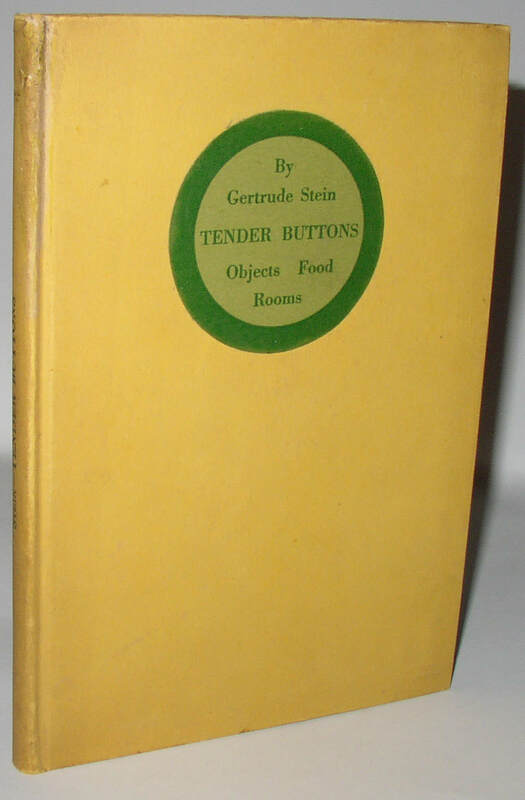 Gertrude Stein, Tender Buttons ; scarce first edition. New York: Claire Marie, 1914. Scarce early book from Stein, fragile and difficult to find in collector’s condition. Condition: Complete; ink owner’s stamp to front free end-paper (13 letters); one area of darkening fragility at the top of the joint between the front board and the spine; it may just be evidence of a tiny bit of repair, but it may just be darkening from the original binding glue. Otherwise only minor wear. Near Fine condition overall. 235. 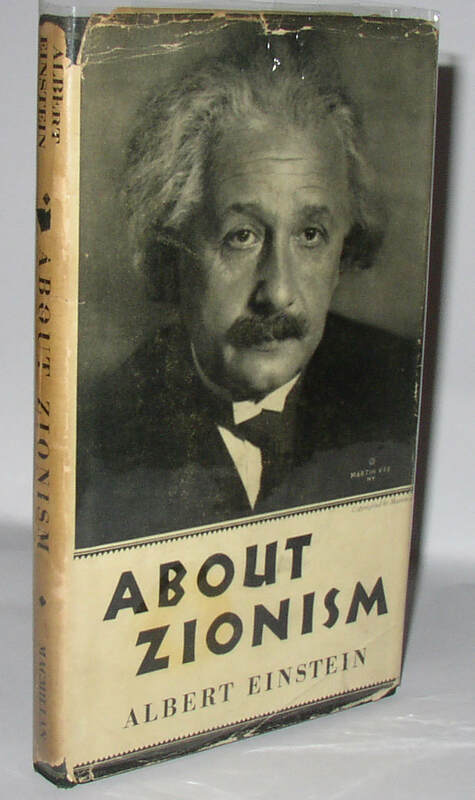 Albert Einstein, About Zionism, rare signed US 1st edition in dj. New York: Macmillan, 1931. An important book by Einstein, scarce first US edition in jacket. 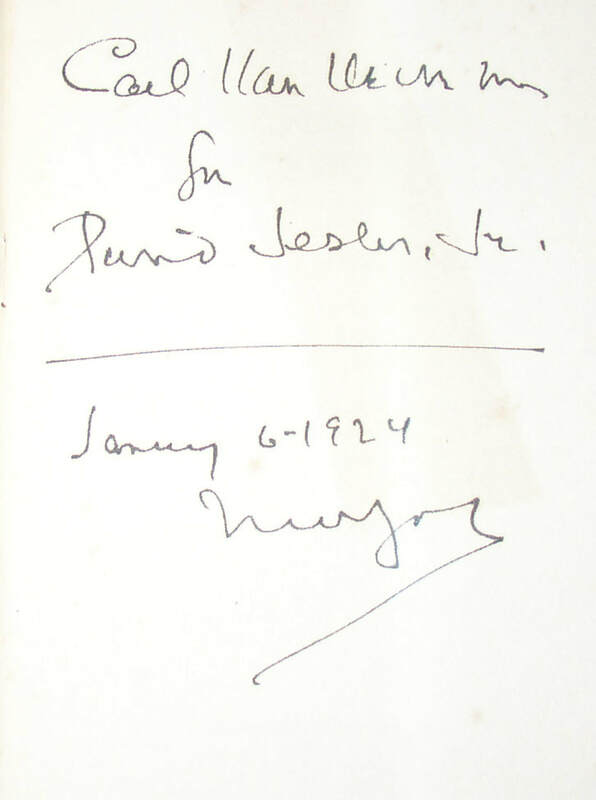 This copy distinguished by a fine inscription and signature in Einstein’s hand: “den Sinn des Lebens kann man/ fühlen, aber nicht mit dem Verstand/ begreifen/ Albert Einstein/ 1932.” (“One can feel the meaning of life, but not understand it with the mind.”) The inscription appears in a blank left for such things upon the bookplate of Arthur Leonard Ross, a New York attorney who appears to have represented both Emma Goldman and Frank Harris, as well as collecting books. Signed Einstein items, needless to say, are very scarce: he is, from almost any perspective, one of the twentieth century’s most notable figures. Condition: Book is close to Near Fine, with five Einstein postage stamps later affixed to the front free end-paper; Ross’s plate, with the Einstein inscription, is affixed to the inside front board. Jacket with some chipping and splitting and tape on the reverse. Good minus. 236. 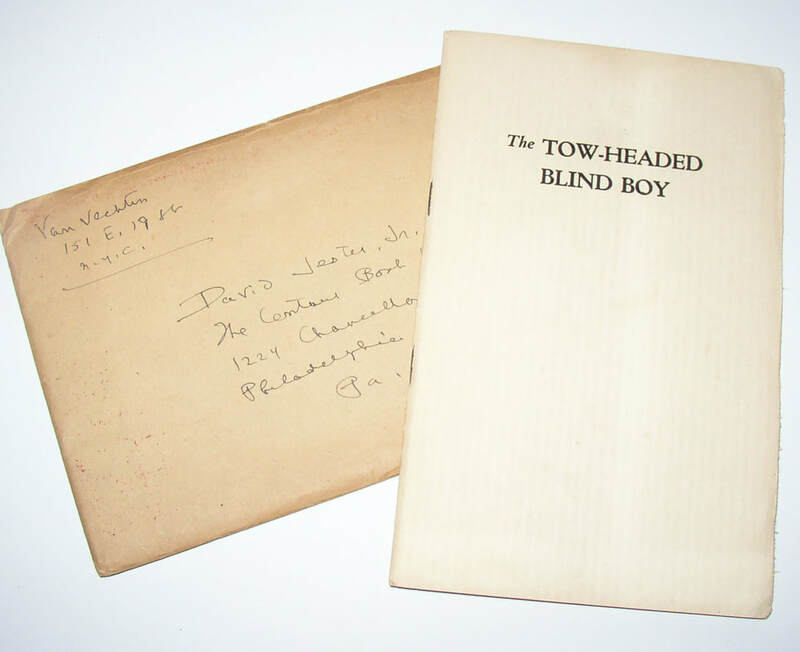 Carl Van Vechten: Signed parody of his work, The Tow-Headed Blind Boy by Samuel Hoffenstein. Privately Printed, 1923. 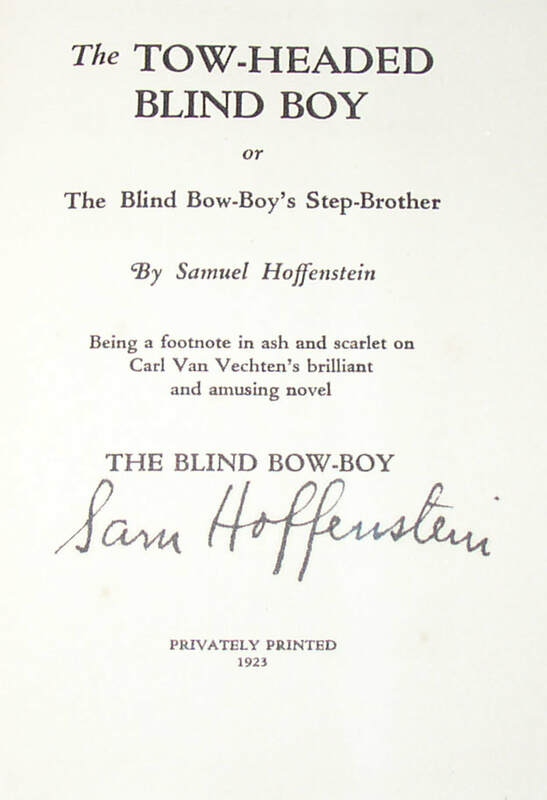 The Tow-Headed Blind Boy, or The Blind Bow-Boy’s Step-Brother, by Samuel Hoffenstein. A short parody of Van Vechten’s The Blind Bow-Boy. This copy signed by Hoffenstein on the title page, and signed and inscribed by Van Vechten to David Jester, Jr. (noted Philadelphia bookseller) and dated Jan 6, 1924. Held in the original mailing envelope, addressed in Van Vechten’s hand, from him to Jester. Hard to find, and very scarce signed by both. 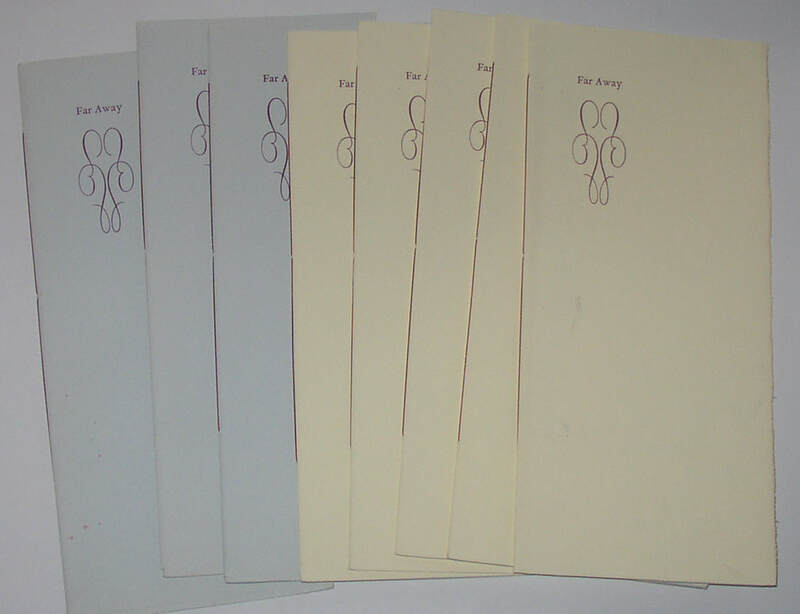 Condition: some toning to paper; envelope with some paper adhered to the reverse. 237. 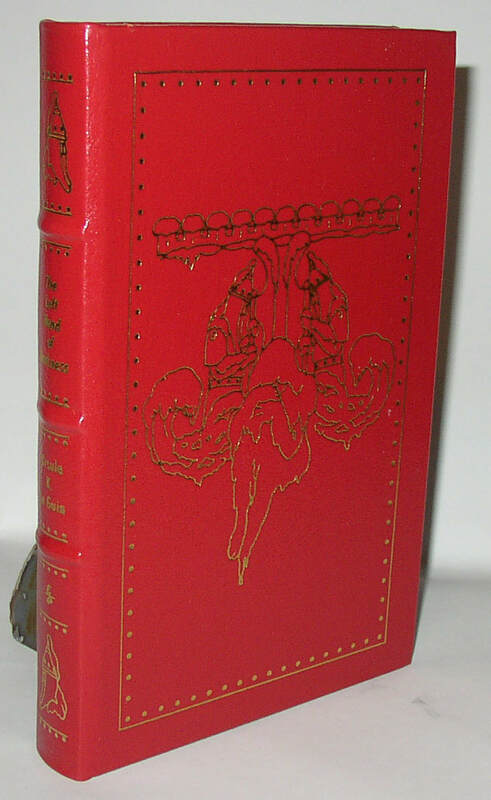 Thomas Bulfinch, The Age of Chivalry, 1st edition, 1859, signed and inscribed by author. Condition: Nearly Fine, with some slight fading to the cloth in the area of the sine, especially at the joint of the rear board. Exceptional condition for a book of this type, I think. 238. 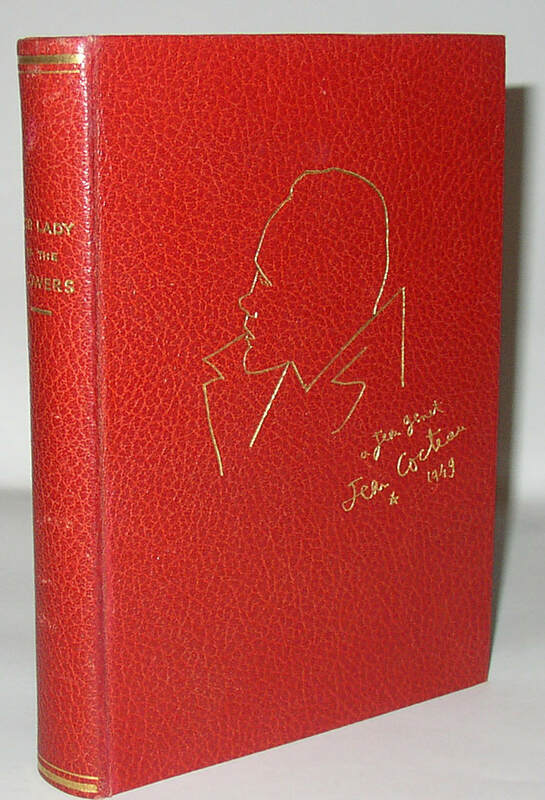 Jean Genet, Our Lady of the Flowers, 1st ed with original slipcase. (1949). Paris: Morihien, 1949. One of 500 copies of Genet’s first English language publication. A beautiful copy in the original stapled cardboard slip-case. Condition: Book is Fine; slipcase has a quarter-inch split and some pencil marks. 239. 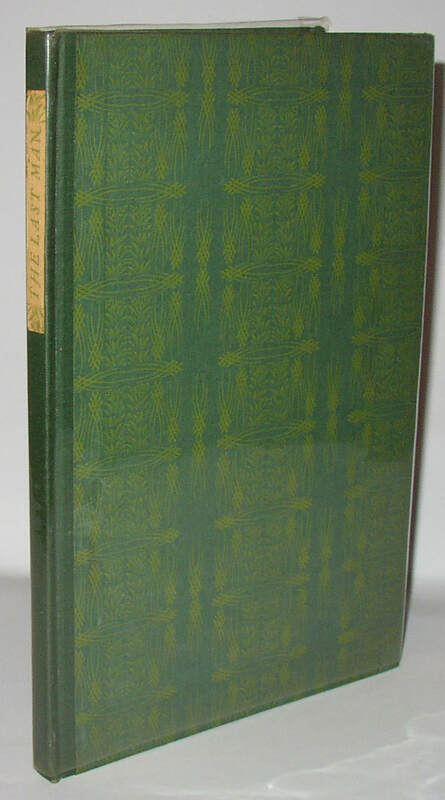 William Butler Yeats, Cathleen ni Hoolihan, 1st ed in original tissue/glassine dust jacket. London: Bullen, 1902. Printed at the Caradoc Press. Usually described as being 1 of only 300 copies; a beautiful small press production of a fragile book. This copy in what appears to be the original glassine dust jacket; the book, in consequence, is especially well preserved. Condition: Book is Near Fine with a couple of minor bumps. Ink Xmas inscription inside, unsigned, and probably not by Yeats. Glassine jacket with some browning and minor loss. 240. 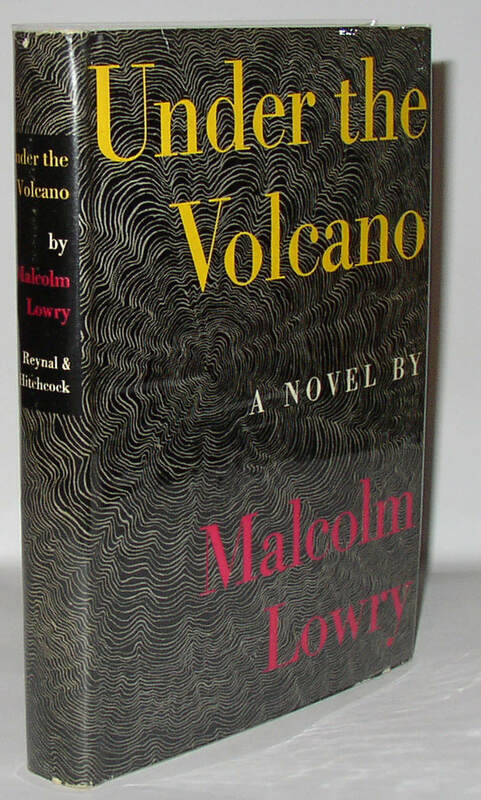 Malcolm Lowry, Under the Volcano, beautiful 1st ed in dj. New York: Reyna, and Hitchcock, 1947. A very beautiful copy of this book, often considered a masterpiece. Very hard to find and collectible in superior condition, as here. 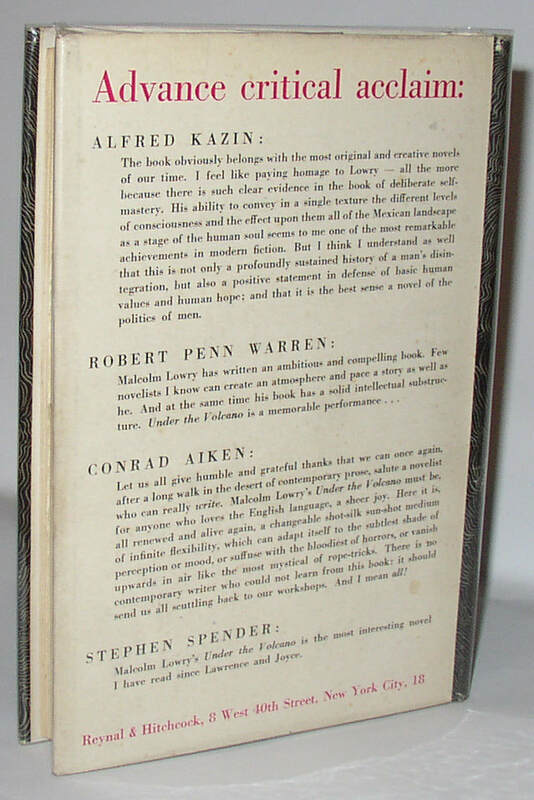 First state dust jacket, with “Advance Critical Acclaim” at top of rear panel. Condition: very close to Fine/Fine. Jacket has some extremely minor flakes here and there at the edges. I see one closed tear (1/4”) without a crease associated, and one little circular surface flake from a bump (about 1/8” across or smaller) at the top of the dj spine. Not a flawless copy, but very close to one. 241. 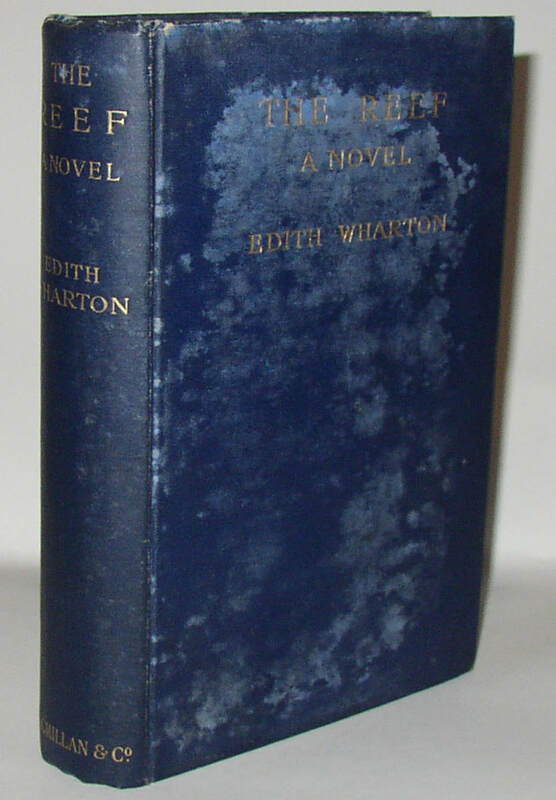 Edith Wharton, The Reef, UK 1st edition (1912); signed and inscribed by Wharton. London: Macmillan, 1912. 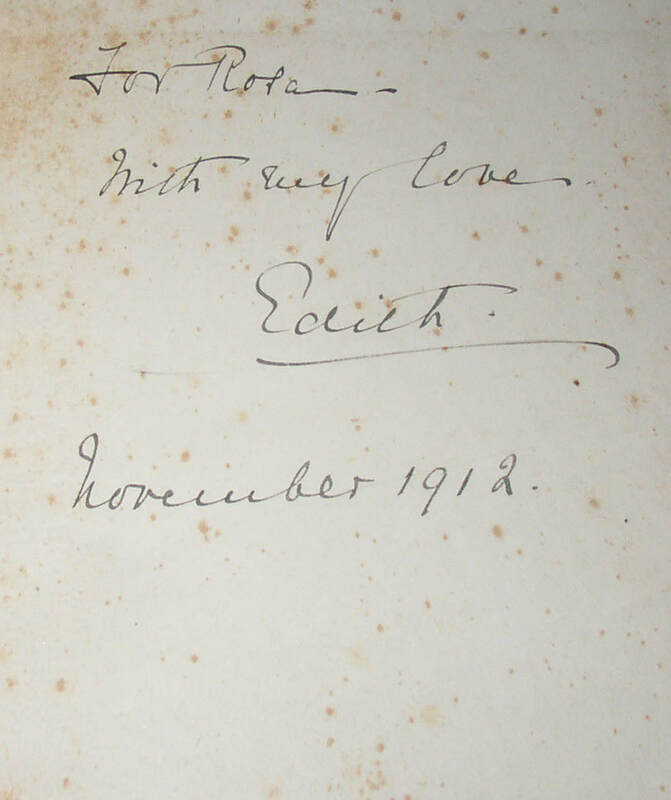 Signed on the front free end-paper, “For Rosa/ With my love/ Edith/ November 1912”. There is a good deal of spotting/ fading/ discoloration to the front and back boards. Condition: with discoloration, as noted; end-papers with foxing spots. Rear hinge splitting. Good or Good minus, perhaps. 242. 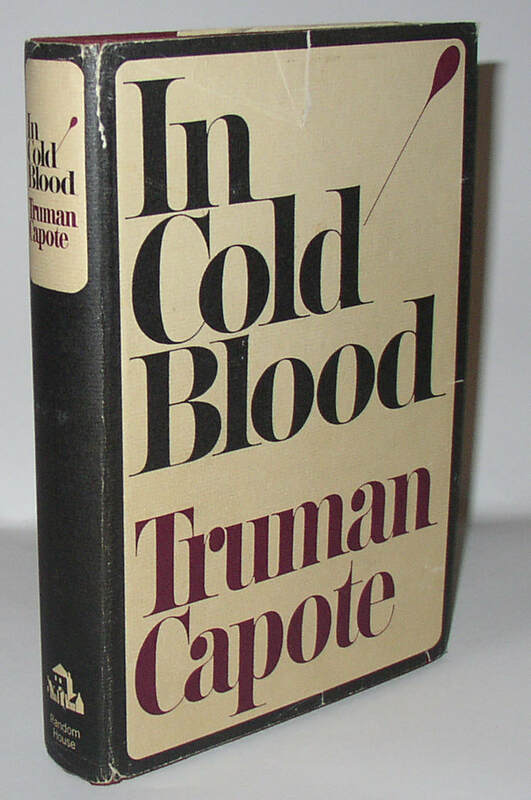 Truman Capote, In Cold Blood, signed and inscribed US 1st edition. New York: Random House, 1965. First Printing stated. Signed and inscribed by Capote on the front free end-paper on January 10, 1966; since the date code on the front flap of the dust jacket is “1/66,” it seems likely that this is a very early inscription in this book indeed. 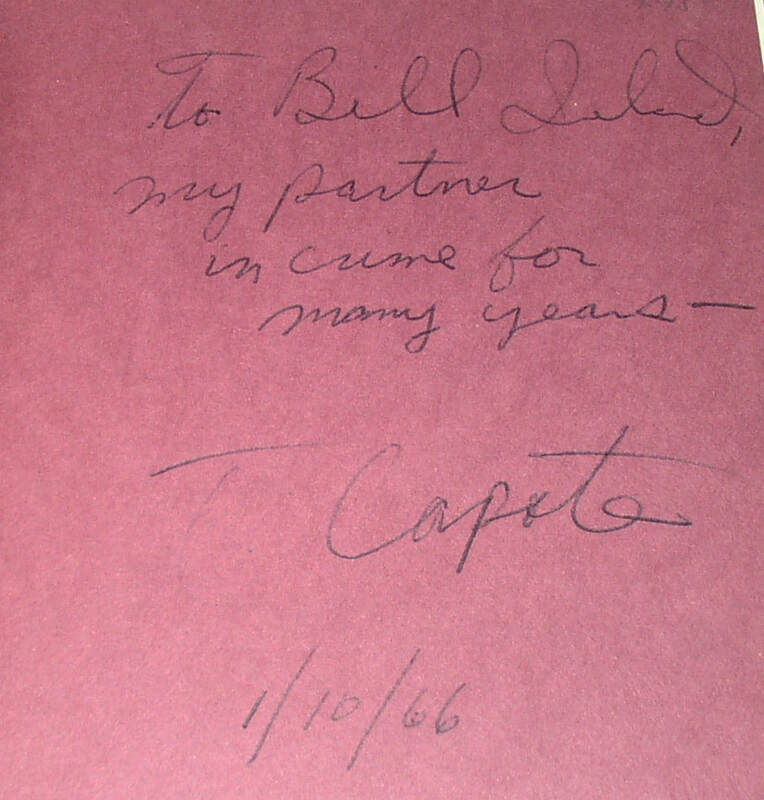 It reads “To Bill Leland [or, perhaps, “Bill Ireland”]/ my partner/ in crime for/ many years--/ T Capote/ 1/10/66.” I have not pinned down the identity of the addressee, but it would seem to be a close acquaintance, and the reference to crime in an inscription to this book of true crime is very nice. Condition: Book is close to Fine; jacket has some tears and tape repairs. 243. 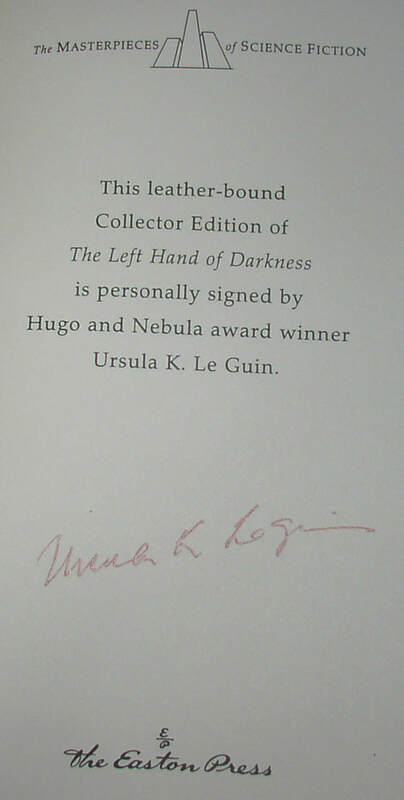 Ursula K Le Guin, The Left Hand of Darkness, signed Easton Press edition (1992). Norwalk, CT: Easton Press,1992. Signed edition of this book from Easton Press’s masterpieces of Science Fiction series. “Collector’s Notes” pamphlet laid in. Le Guin’s most brilliant and respected novel. Condition: Nearly Fine and as new, one small flaw to the leather at the top of the front board. 244. Century Edition De Luxe of Louis Raemaekers’s War Cartoons, limited edition, 1917. Century, 1917. 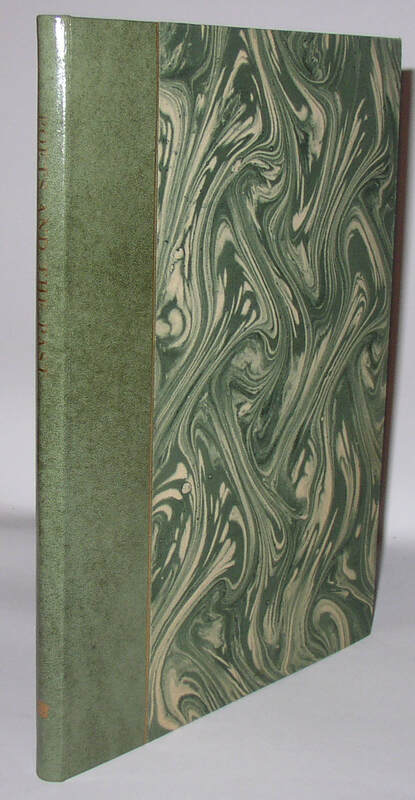 One of 1050 copies; 2 large folio volumes in cloth dust jackets and in original slip-case. Name of original subscriber effaced by scraping on colophon page. About 125 plates, some in color. A finely printed collection of WWI art. Introduction by Theodore Roosevelt. Condition: Some wear at the spines and spine labels, and with the slipcase also showing significant wear. But it is holding together, and it and the jackets have protected the books well. 245. 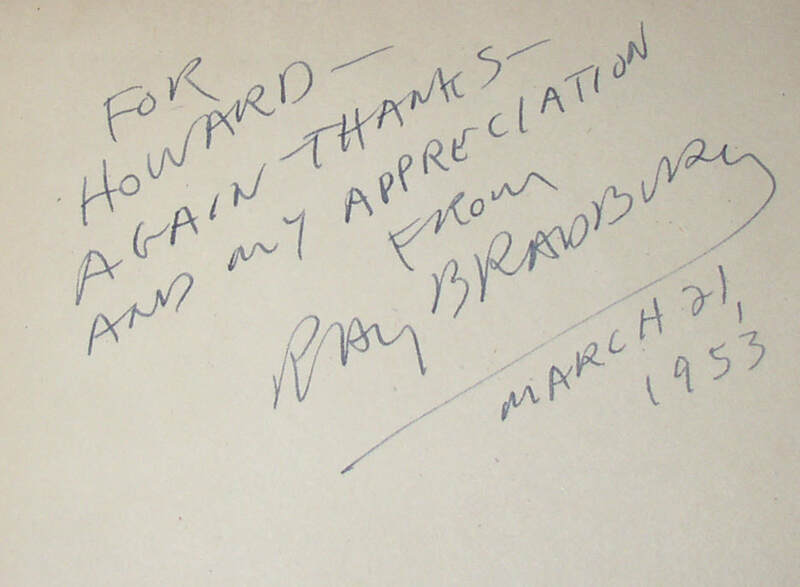 Ray Bradbury, Dark Carnival, signed 1st Arkham House edition (1947). Sauk City, WI: Arkham House, 1947. Signed and inscribed by Bradbury in 1953—not as early as the publication of the book, but a relatively early date, regardless, as Bradbury would go on to sign books for collectors in many later decades. 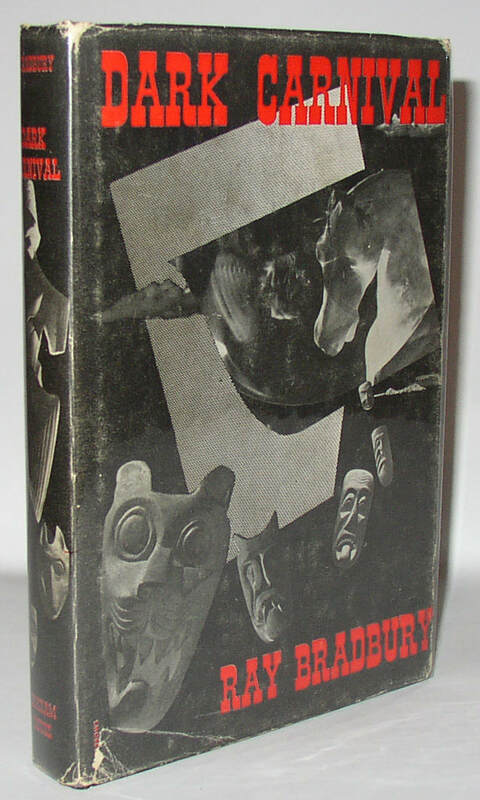 Bradbury’s first book, and very collectible. Condition: Book is Near Fine: jacket is Good, with wear at the edges and old tape reinforcement on the inside/reverse side. 246. 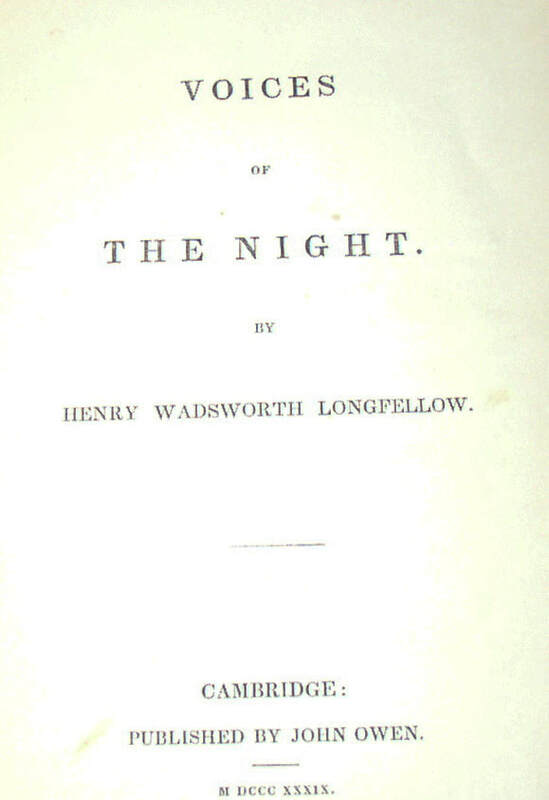 Henry Wadsworth Longfellow, Voices of the Night, 1st ed (1839). Cambridge: John Owen, 1839. An early issue, mixed state, not featuring all of the earliest points, but with an early ownership inscription dated Feb 11th 1840, from Increase N. Tarbox, noted theologian and author. Condition: Good in original binding, showing some wear and fragility and loss. 247. 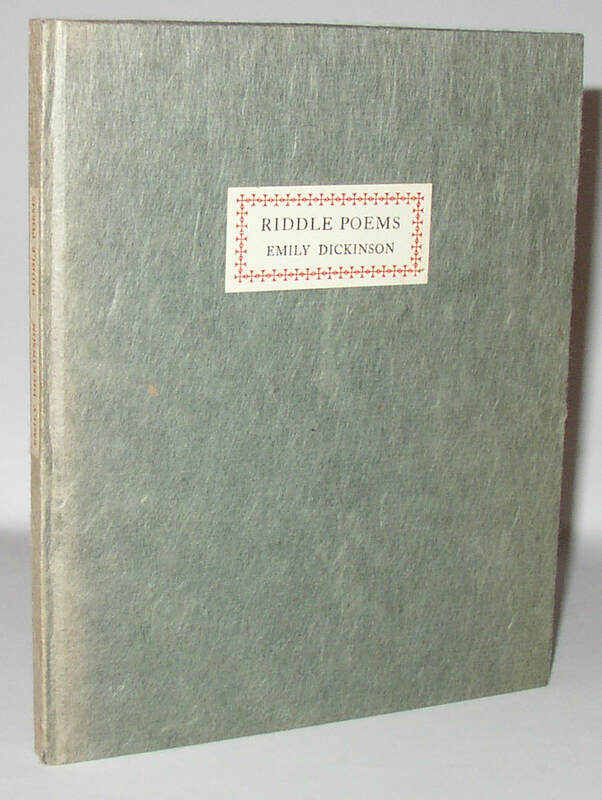 Emily Dickinson, Riddle Poems, scarce 1st edition. Northampton: Gehenna Press, 1957. Number 80 of an edition limited to 200 copies; this one bound in paper-covered boards and numbered “80” in Arabic numerals (apparently there was also a Roman numeral issue, limited to CC copies, presumably). Very scarce on the market. Signed by the publishers at the colophon. Condition: Near Fine, with mild fading at spine. 248. 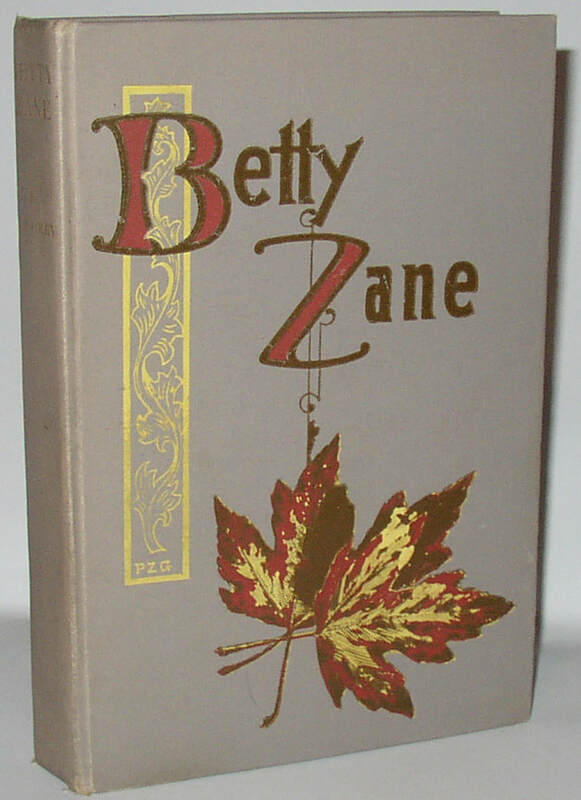 P. Zane Grey, Betty Zane, scarce 1st edition (1903). New York: Charles Francis Press, 1903. First edition, first printing of Grey’s hard-to-find first novel. Showing some signs of wear, but still solid. Condition: foxing to end-papers, and some fingerprints to pages from reading. No ownership inscriptions inside. Paper just beginning to split at the inside front hinge; some fading to gold printing on the spine. Overall about VG, and probably a bit better than most copies encountered. 249. N C Brooks. 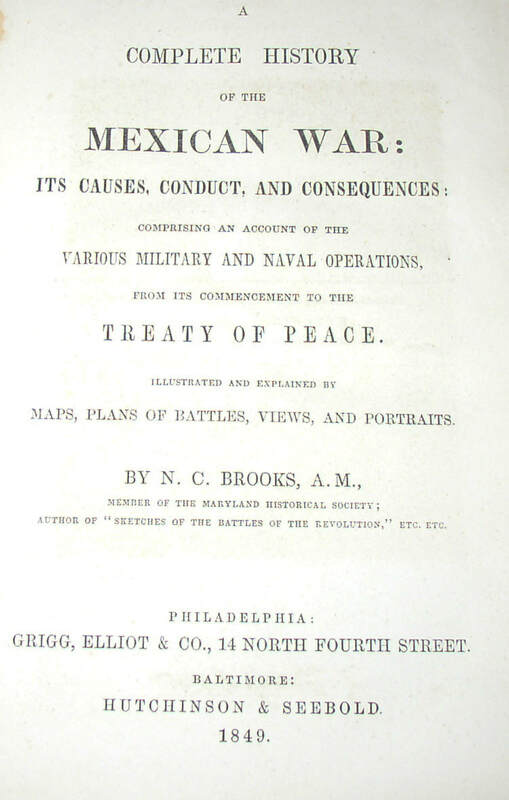 A Complete History of the Mexican War (1849), signed 1st edition. 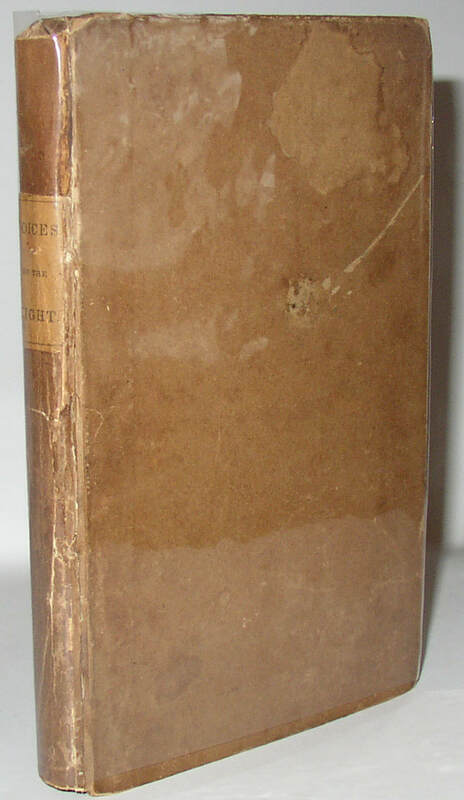 Philadelphia: Briggs, Elliot, & Co, 1849. 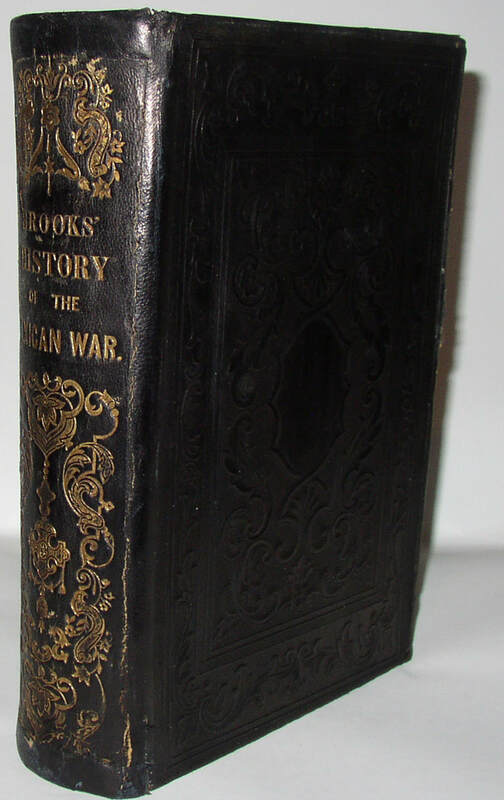 Scarce early history of this war, made even scarcer by the presence of the author’s inscription (dated 1881) on the second free end-paper. Condition: Boards reattached attractively; some internal foxing. About VG. 250. Ernest Hemingway. 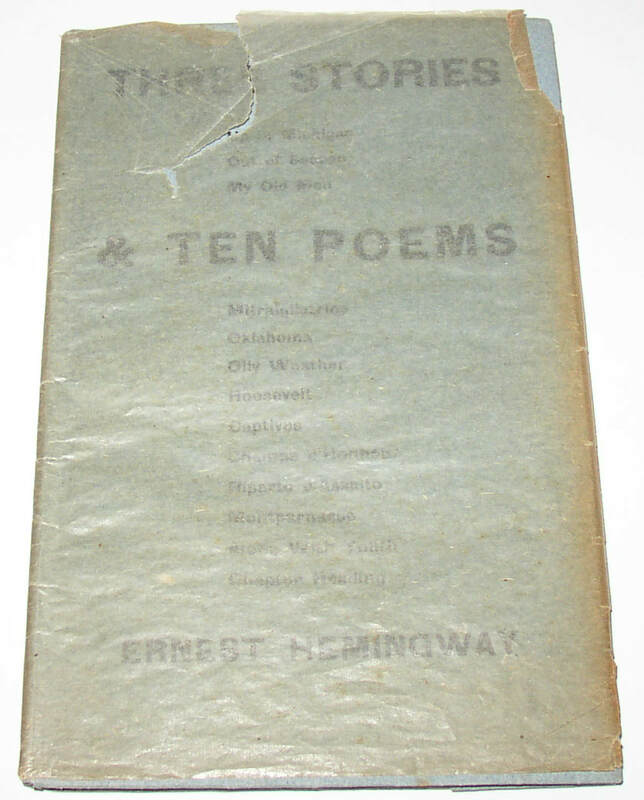 Three Stories and Ten Poems, rare 1st edition (1923). Unopened. [Paris: Contact, 1923]. Ernest Hemingway’s first book, printed in an edition usually stated to be only 300 copies. Blue-grey printed paper wraps. Very scarce, and very collectible, this copy is unread and its pages are uncut; indeed, it remains in a glassine wrap-around wrapper which is presumably original. Incredibly scarce as such: perhaps unique, and probably as fine a copy as one could hope to find. Condition: About Fine, in glassine wrap-around that shows some tears, splitting and loss, but which remains solid and in place. One might just be able to slide the book out of the wrap, but only with the greatest of care. One can see just looking at the top edge that the book is unopened and the pages uncut. Now held in a protective clamshell case.